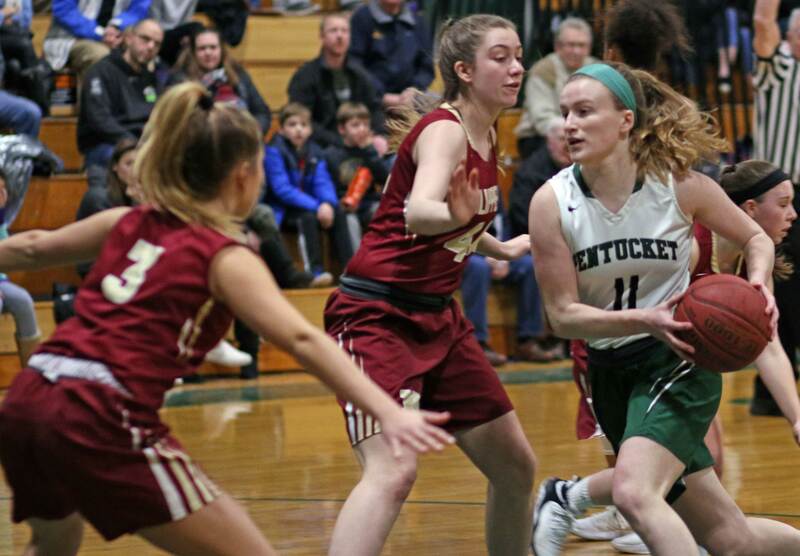 (West Newbury MA) The Pentucket defense always catches your eye. 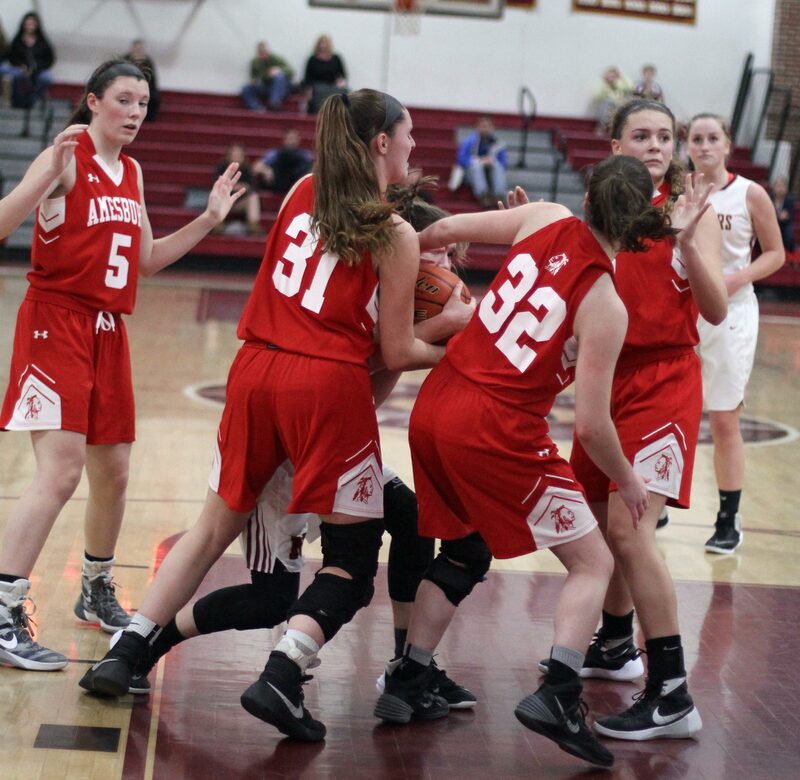 There are times when you’re sure that the Sachems must be using extra players because of the way they double team opponents. 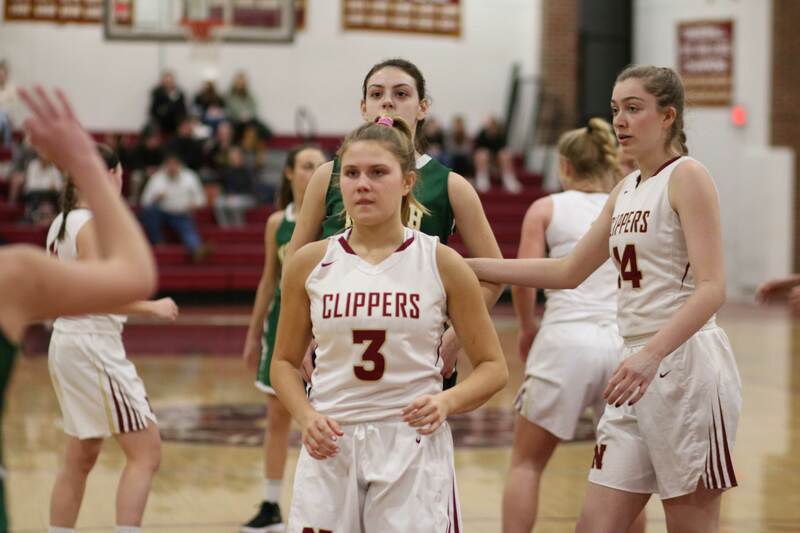 Tonight their defense was good but 3-point shooting was even better as they defeated Newburyport, 68-44, on a very cold Monday evening. 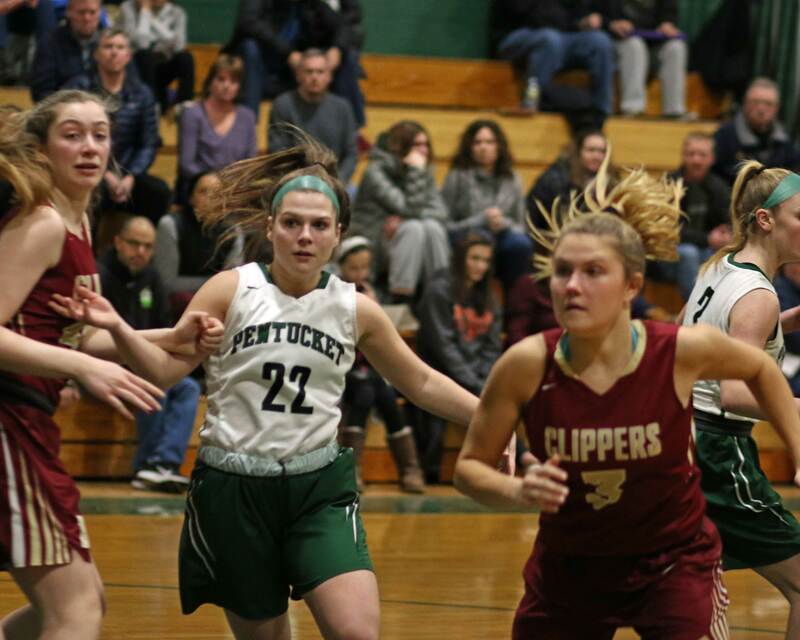 Pentucket (12-1) has now won nine straight and have the best record in Division 2 North. Swampscott is the only other D2 North team with one loss, but they’ve only won eight games. 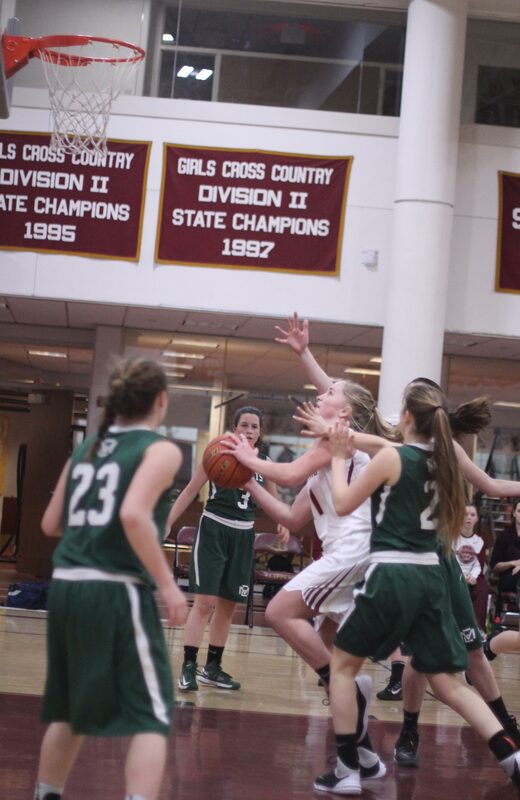 The Sachems had good offense going from the get-go. 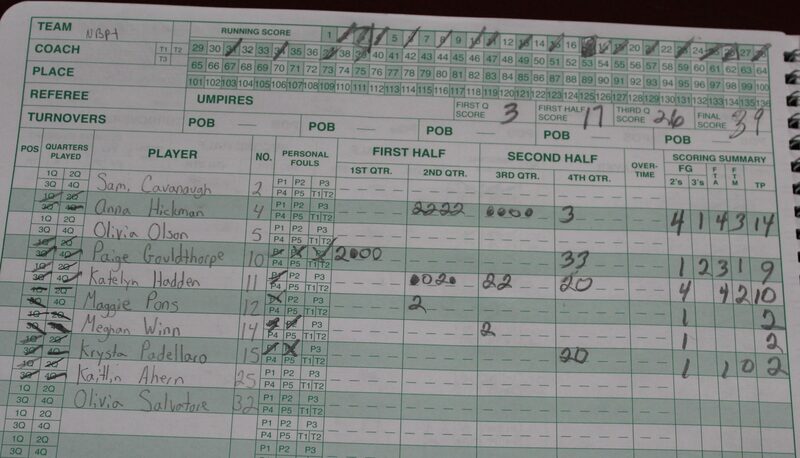 They jumped ahead 8-2 and ran that lead to 19-9 with two minutes left in the first quarter. 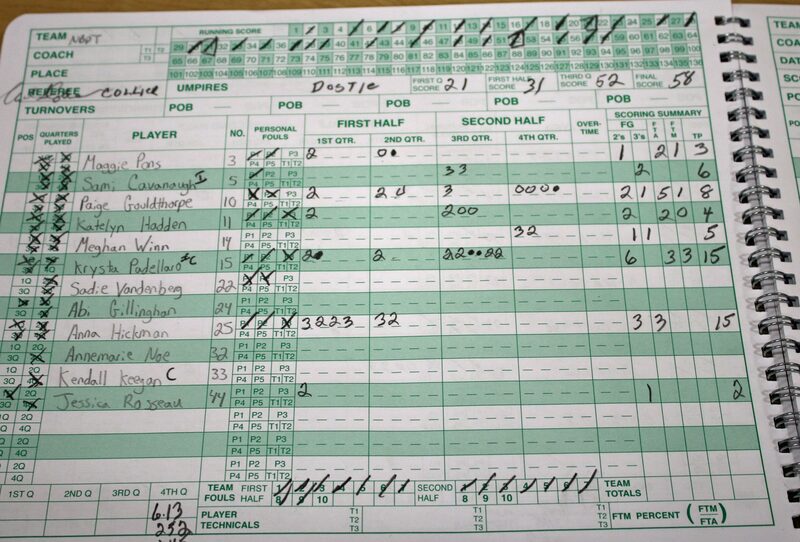 By then Pentucket had already drained three 3’s and they added another triple before the quarter ended and led, 23-9. 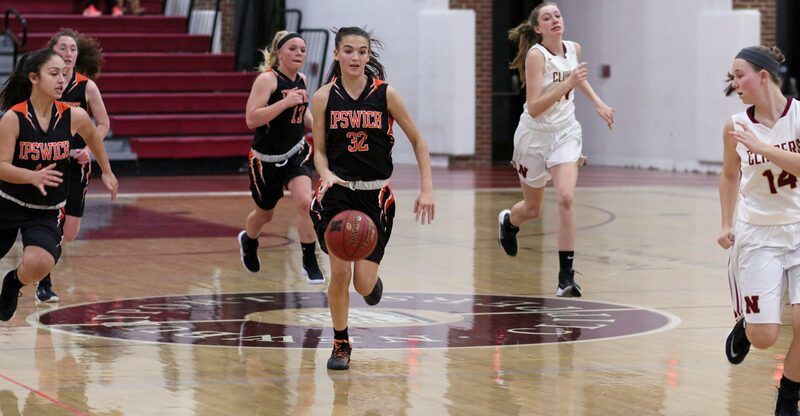 The Sachems would edge further ahead (36-18) at the half. The first two minutes of the second half settled the outcome. 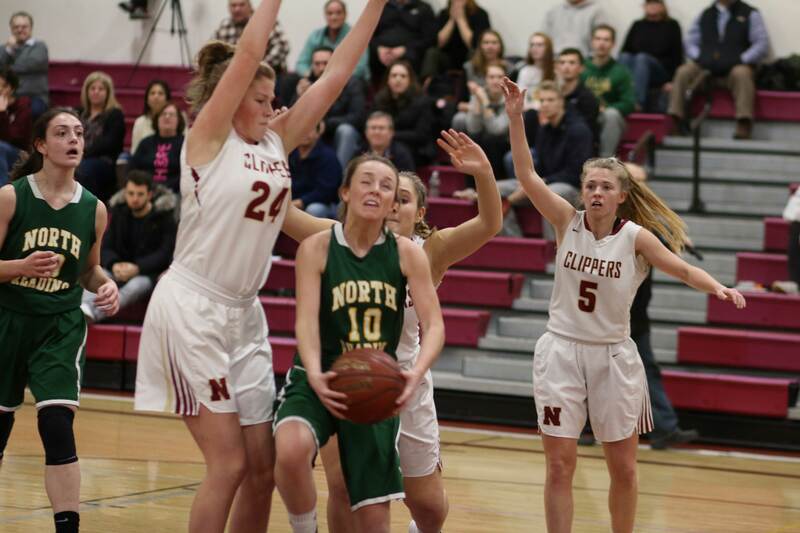 Three different Sachems dropped three’s while at the same time NHS was held scoreless and had two turnovers. 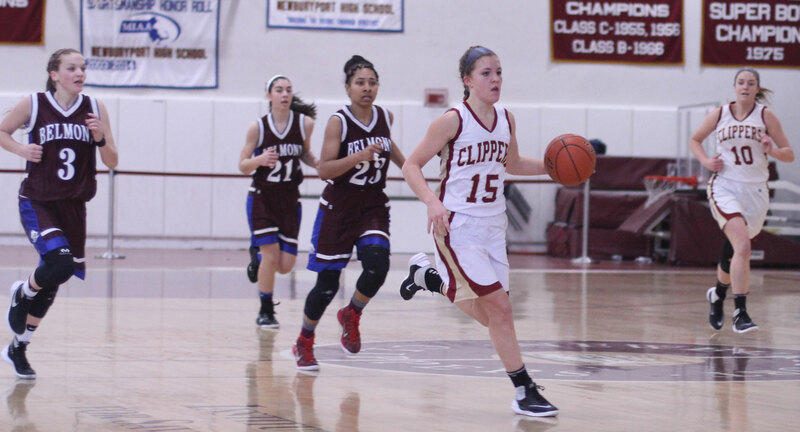 Angelica Hurley (21 points) had the first triple after the possession was kept alive with two offensive rebounds. Next it was Maddie Doyle assisted by Angelina Yacubacci. Finally, Arielle Cleveland joined the 3-fest assisted by Angelica Hurley. 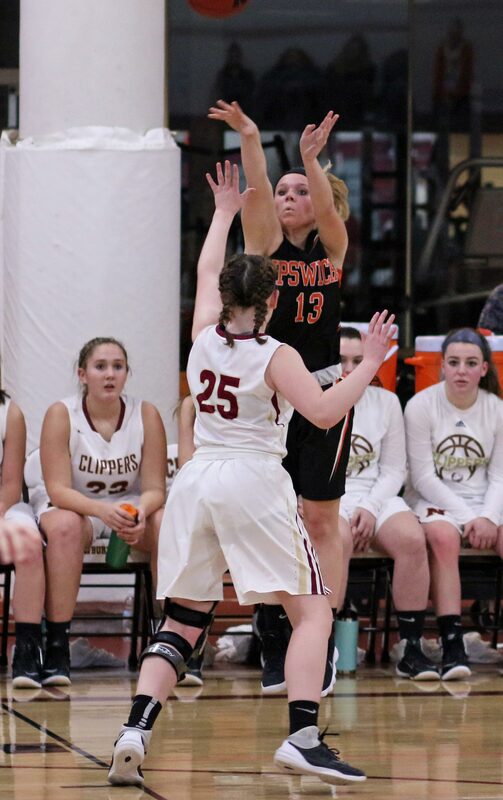 Those two minutes of long-range accuracy combined with shutdown defense extended the Sachem lead to 45-18. The Clippers (6-5) did put a nice run of ten unanswered points together at the end of the third quarter. 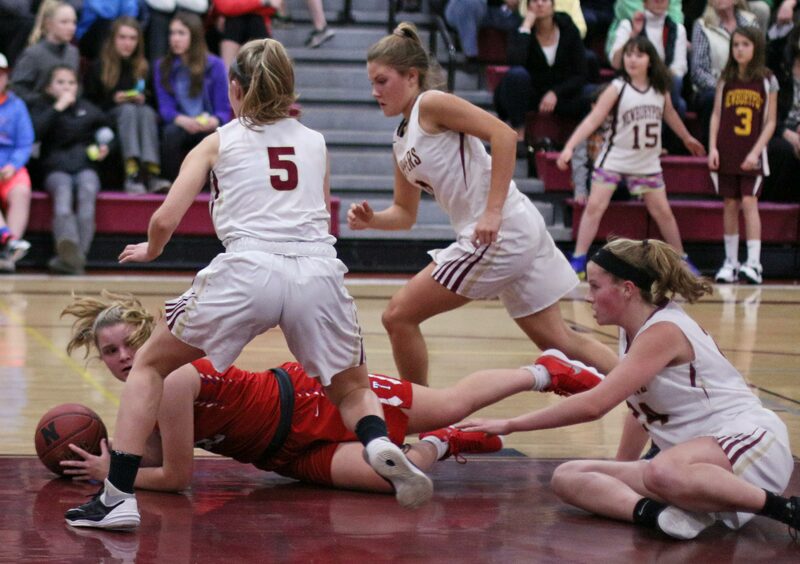 Both Katie Hadden and Anna Hickman (14 points) had multiple baskets during this stretch. “The reason we won tonight was because we played together as a team,” explained Angelina Yacubacci afterwards. That teamwork showed itself on defense as the Clippers had little space even to attempt 3-point shots. 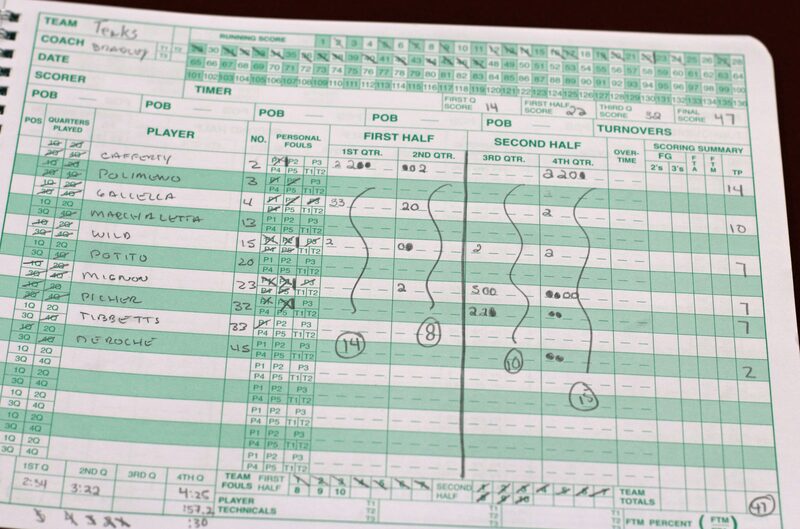 The telling statistic was that Pentucket made eleven 3’s while Newburyport didn’t get any. 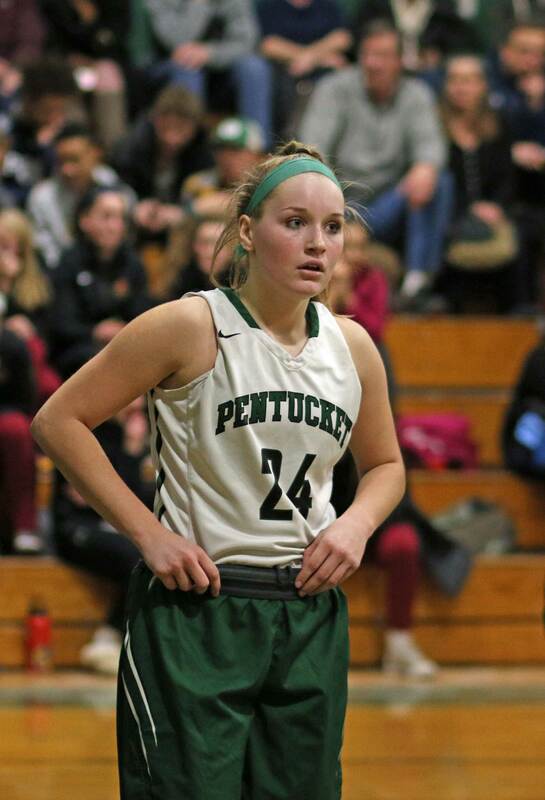 Angelica Hurley paced Pentucket with twenty-one points, including four three’s. 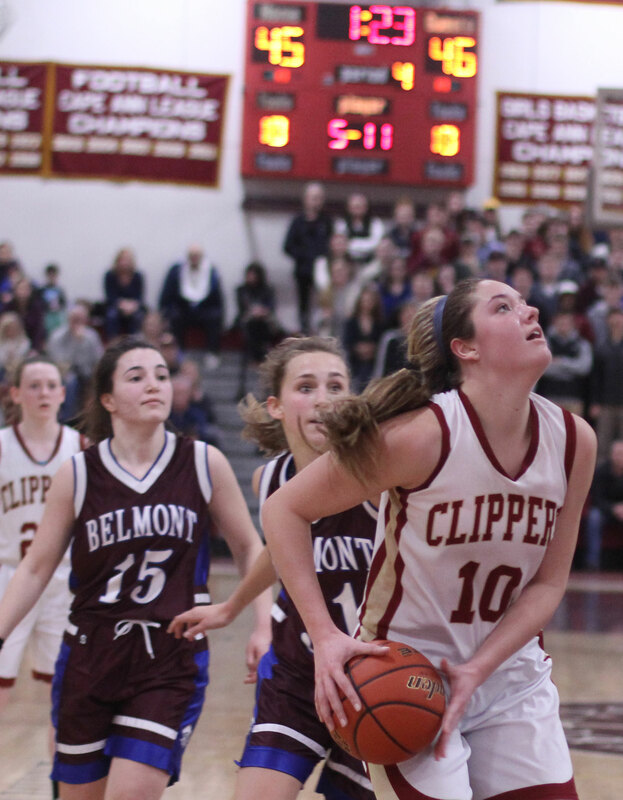 Jess Galvin had sixteen points with eleven of them in the breakaway first quarter. She also had four triples. 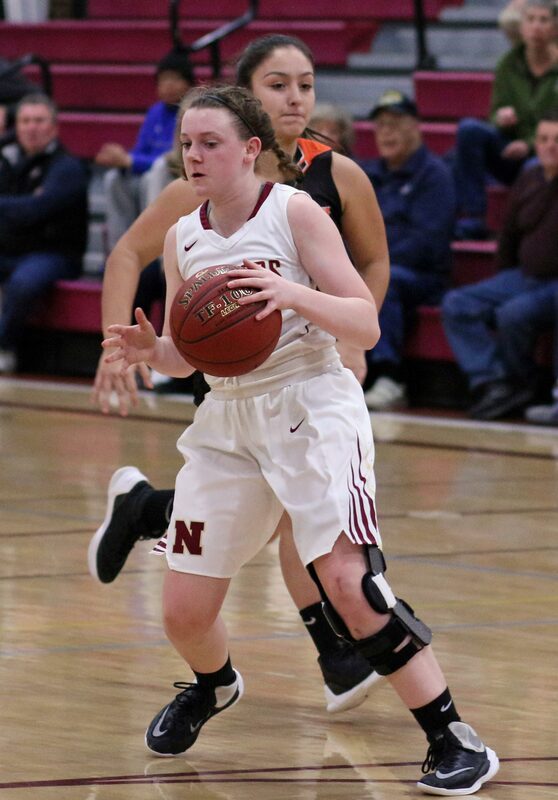 Anna Hickman led Newburyport (14 points) and teammate Abi Gillingham added eleven points. 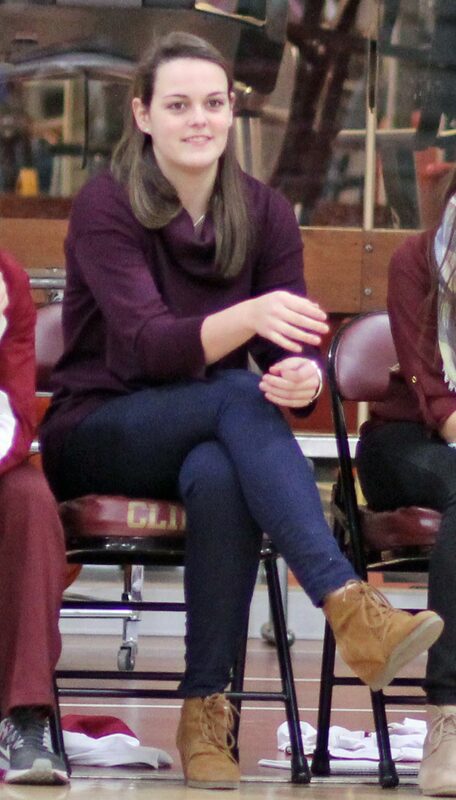 Kelsi McNamara (St. Joe’s) was in the house. Bob Melillo (North Reading) and Bob Romeo (Masco) were also in the house looking at future opponents. (Newburyport MA) It isn’t often that you go to one game and see two of them. 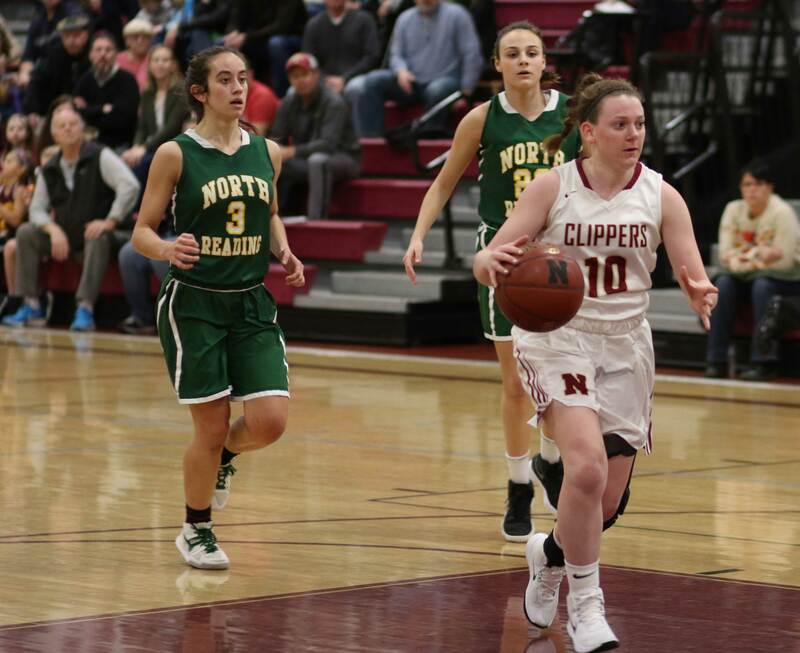 If all you saw was the first half of tonight’s Newburyport/North Reading game, you would have been very impressed with the Hornets. They made shots in close and from long range (five 3’s). 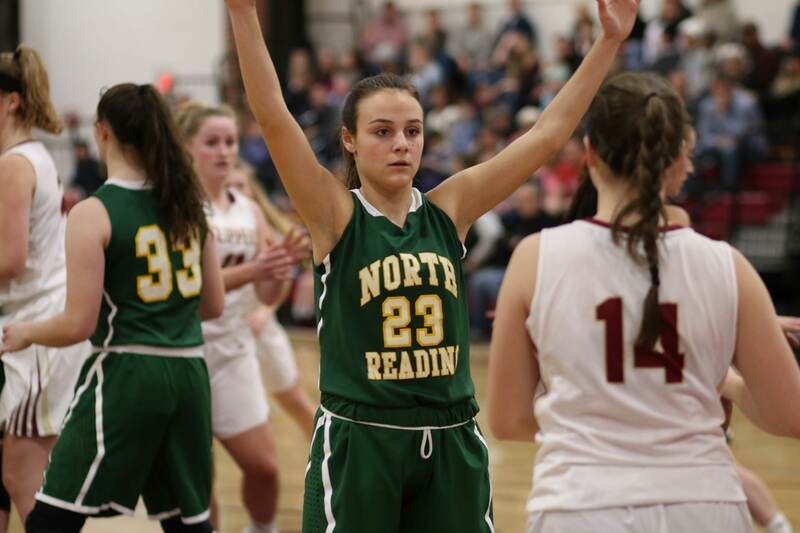 The North Reading defense forced nine turnovers in the first half and Julia Howse had several blocks on layup attempts. 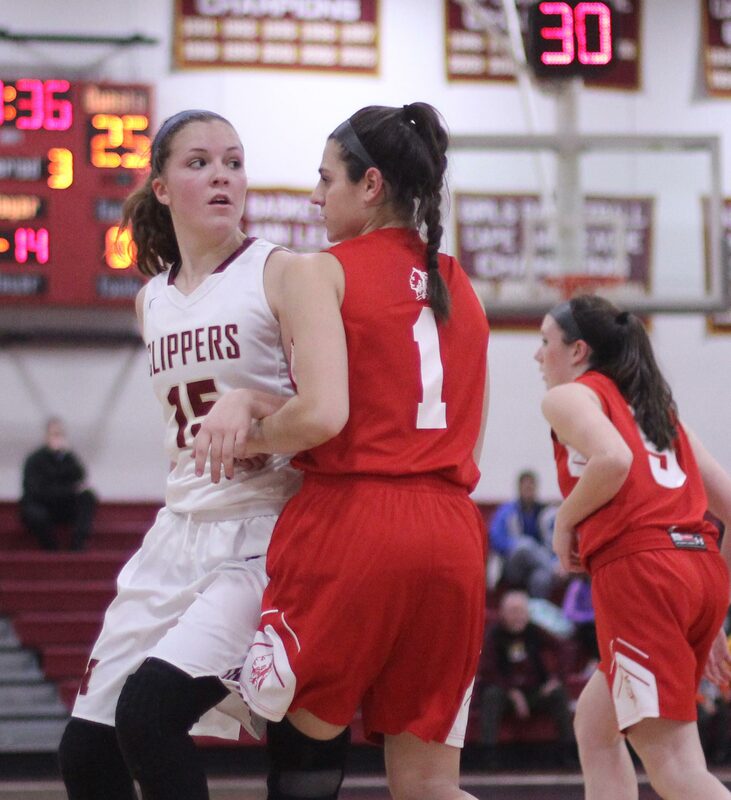 Junior Ali Grasso had thirteen points and NR led, 35-27. 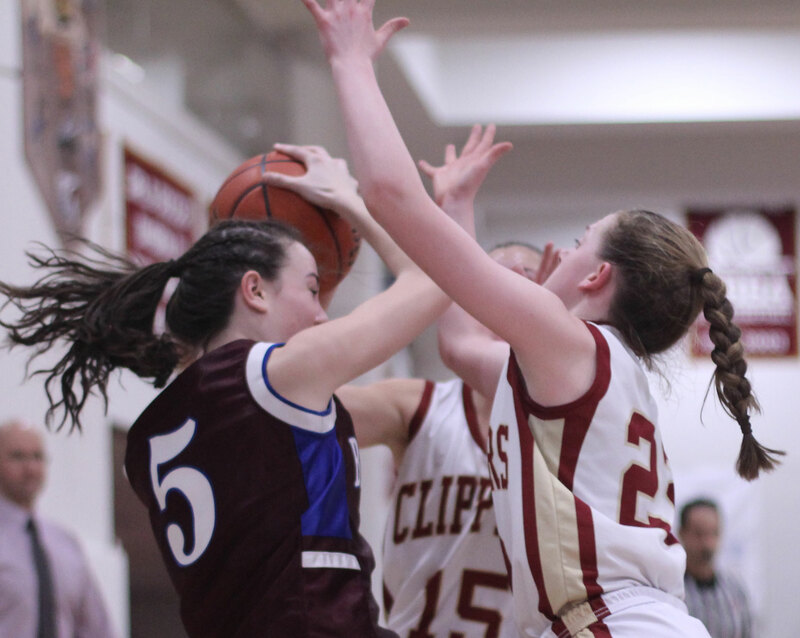 Fortunately for Newburyport there was a second half and it was their turn to dazzle. 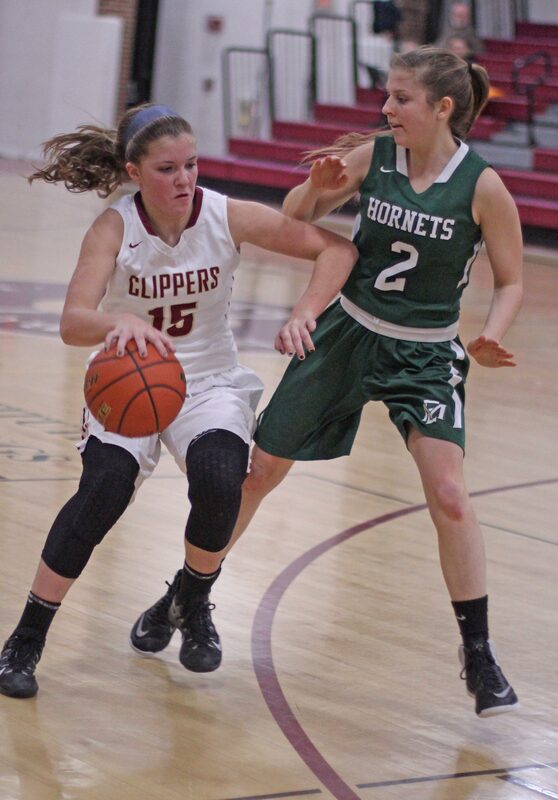 The Clippers caught the Hornets in the third quarter and blew the visitors out in the final quarter to win, 65-49. 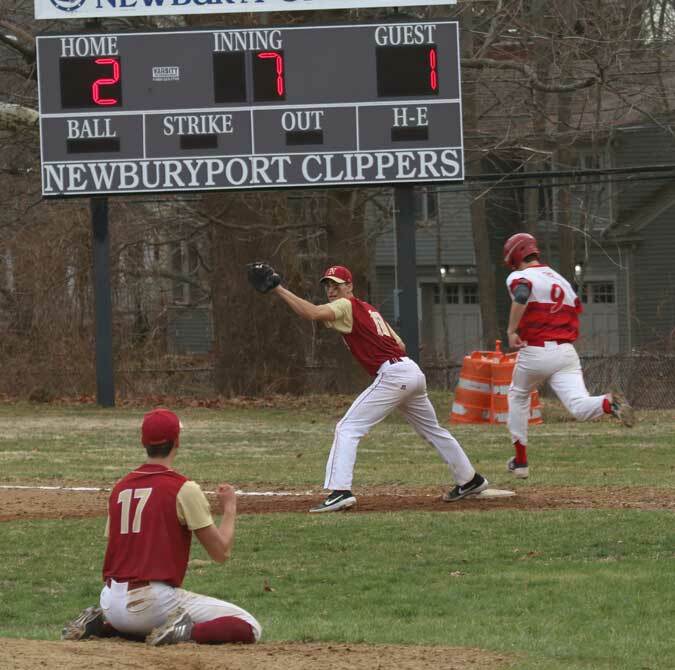 Newburyport (6-4) has now won six of their last seven games. “We can compete with anyone when we play well,” explained NHS coach Karen Grutchfield. One significant improvement was lessening the turnovers. In this game the Clippers had nine TOs in the first quarter but had only ten more over the final three periods. 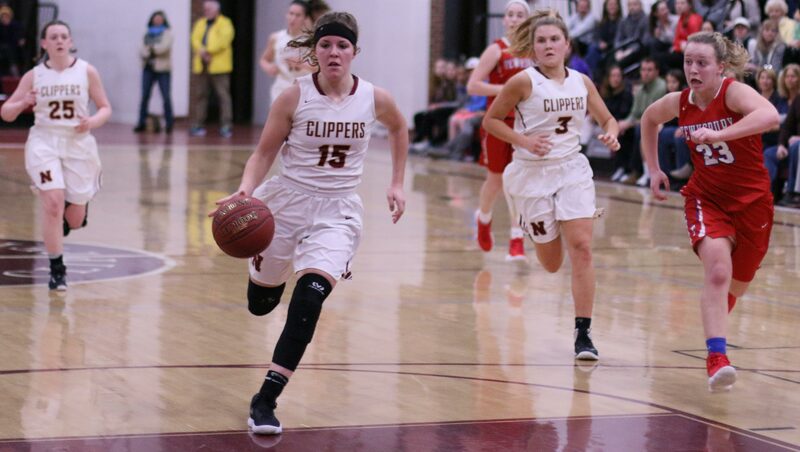 Sami Cavanaugh (15) led the Clippers. 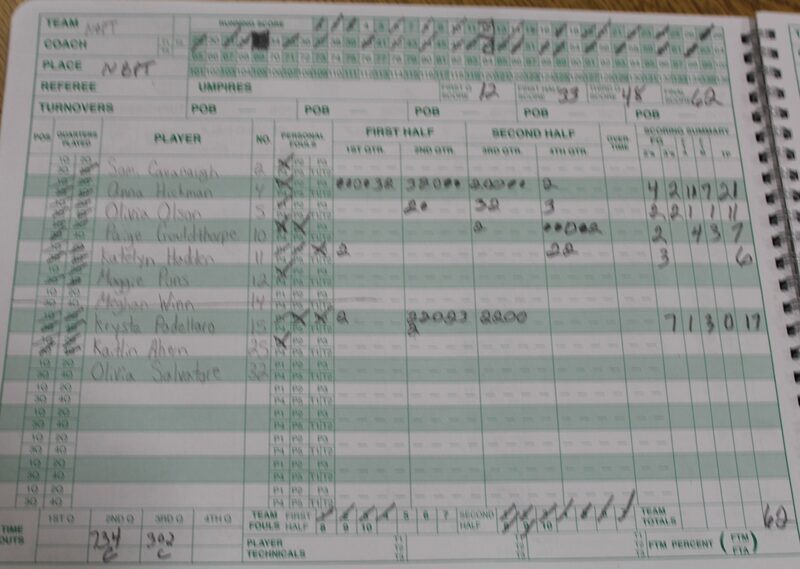 Anna Hickman (12), Katie Hadden (11), and Meg Winn (11) were also in double figures. 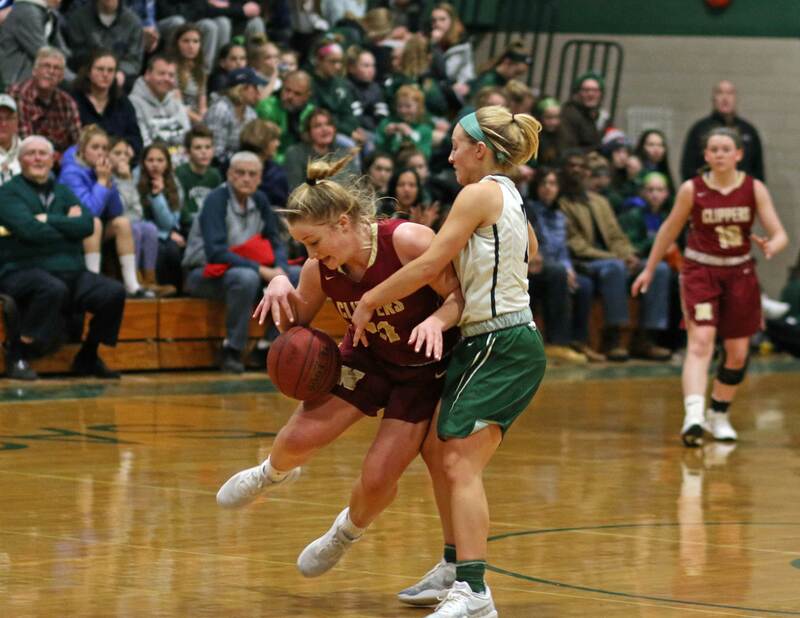 Junior Ali Grasso (23 points) led the Hornets. 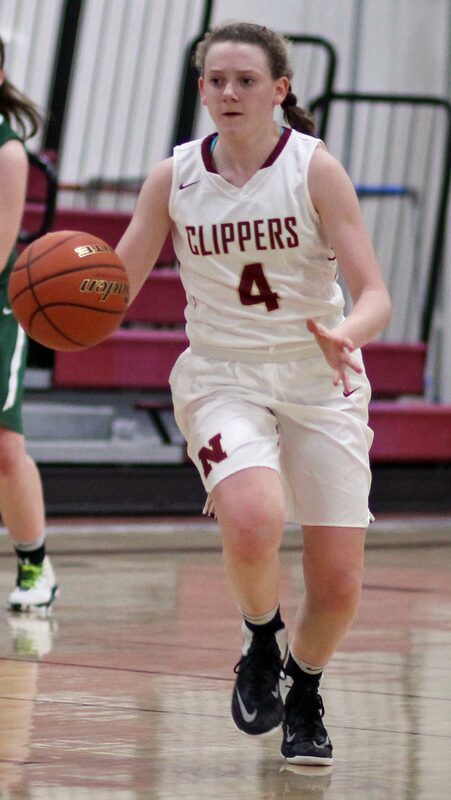 A key to the Newburyport win? 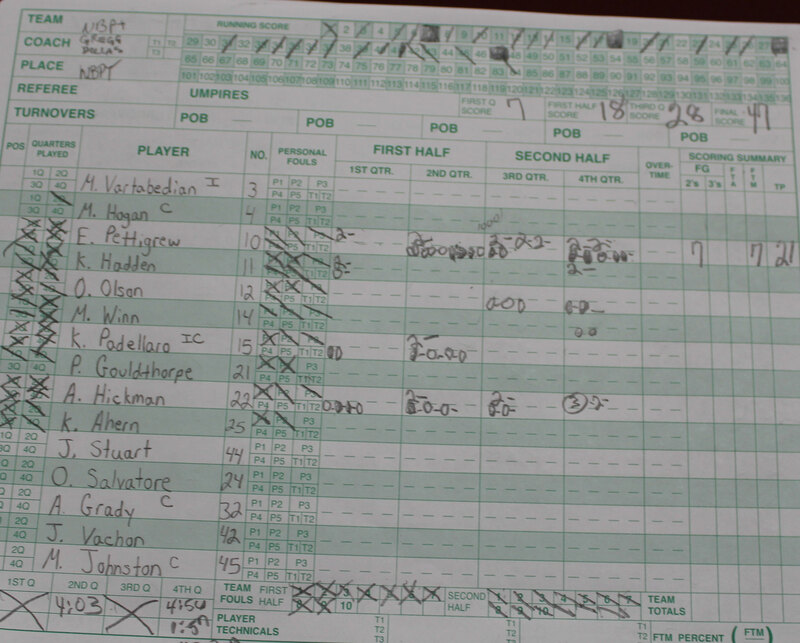 Ali Grasso had only two points in the final quarter. 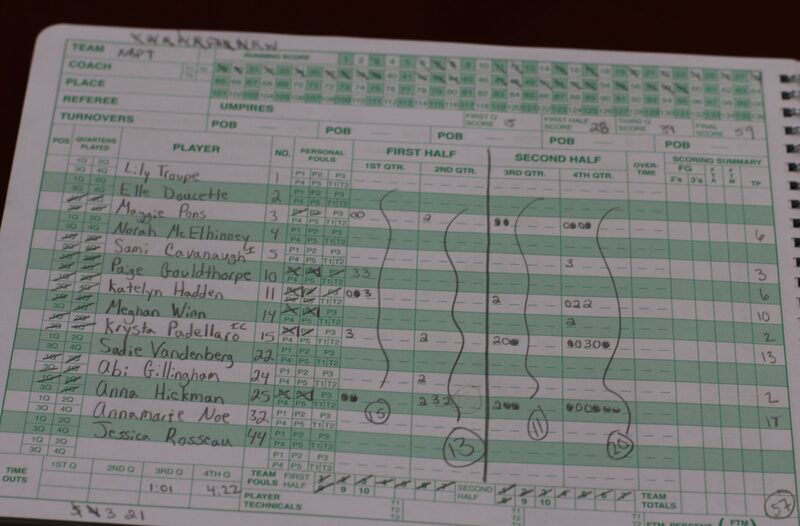 The teams were tied, 44-44, going into that final quarter. 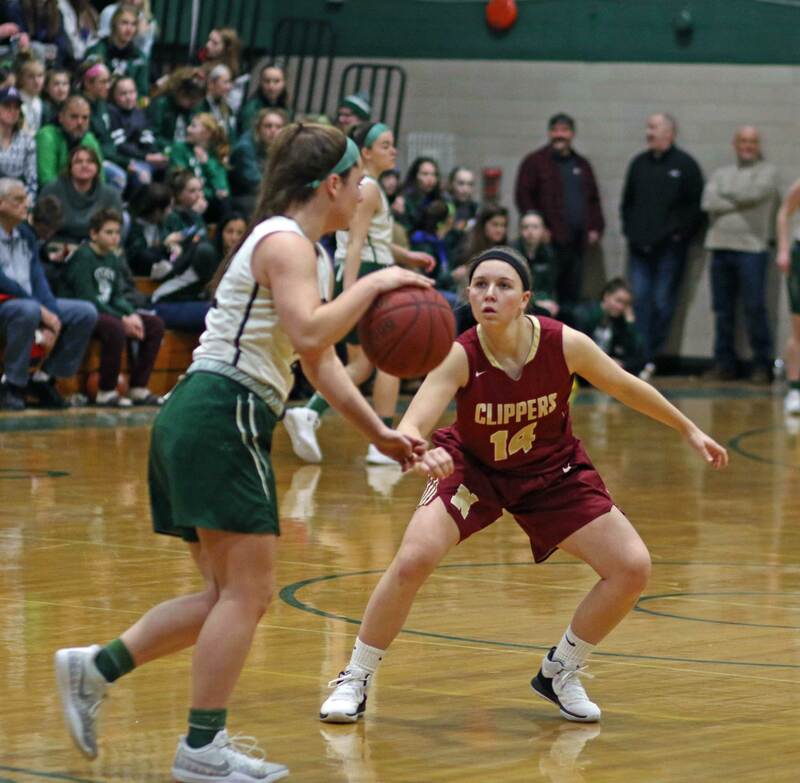 The Clippers tight defense, with Sami Cavanaugh covering Ali Grasso, limited the visitors to one Ali drive in the first four minutes. Meanwhile, the Clippers get-to-the-basket approach turned up three layups, and four free throws. Meg Winn added a triple. That’s a thirteen-point collection! 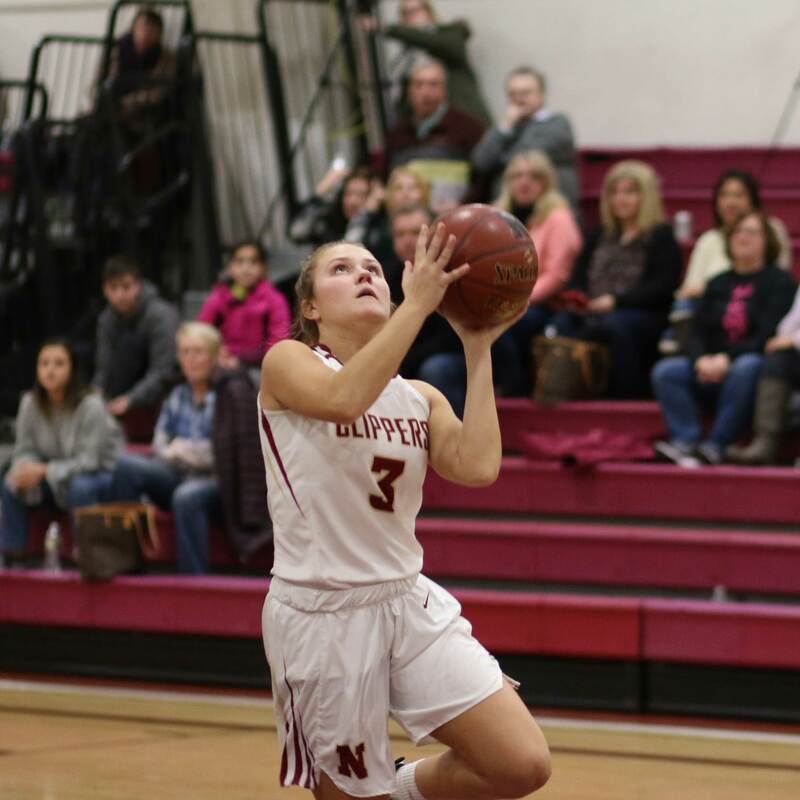 The burst of good everything separated the Clippers, 57-46, from NR and the Hornets couldn’t recover. 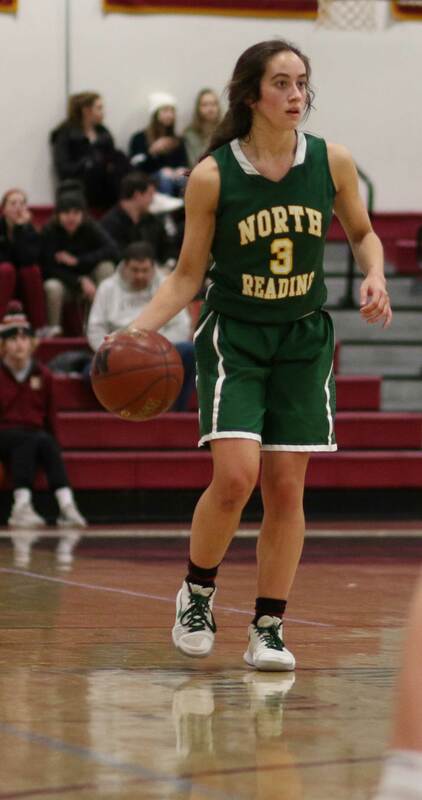 North Reading (7-3) had won four straight games prior to tonight’s loss. 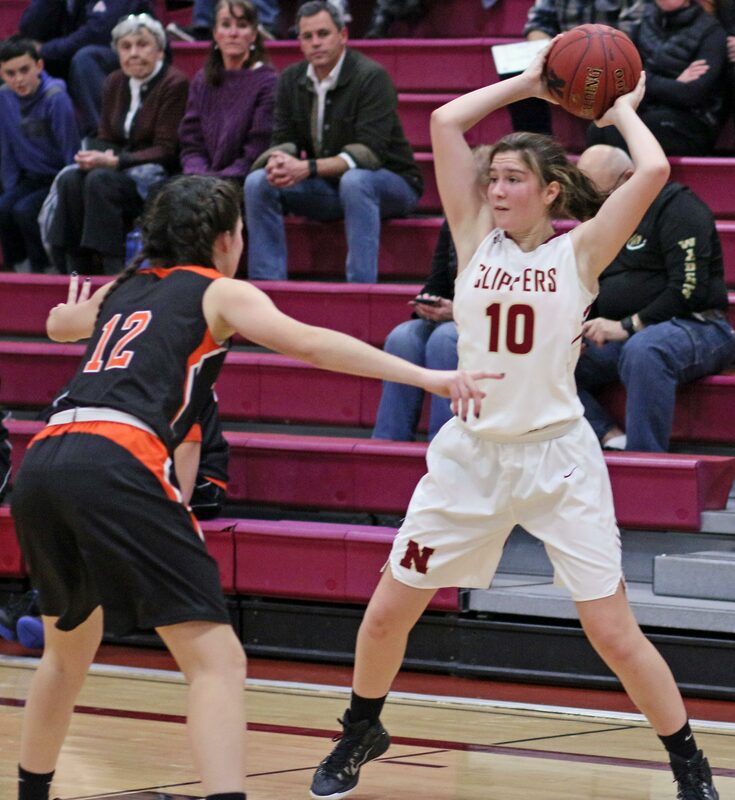 The Hornets defeated Newburyport, 53-45, in December at North Reading. 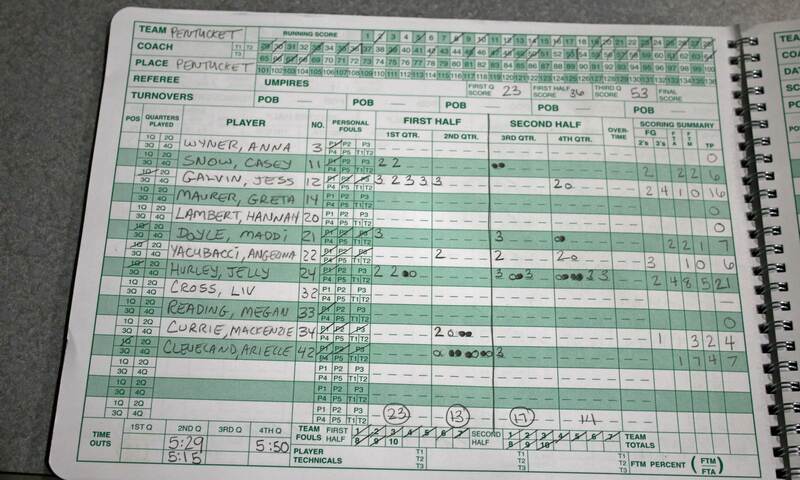 Casey McAuliffe had seventeen for NR in the win. Tonight, Casey ended with seven points and none of them after the first minute of the second period. 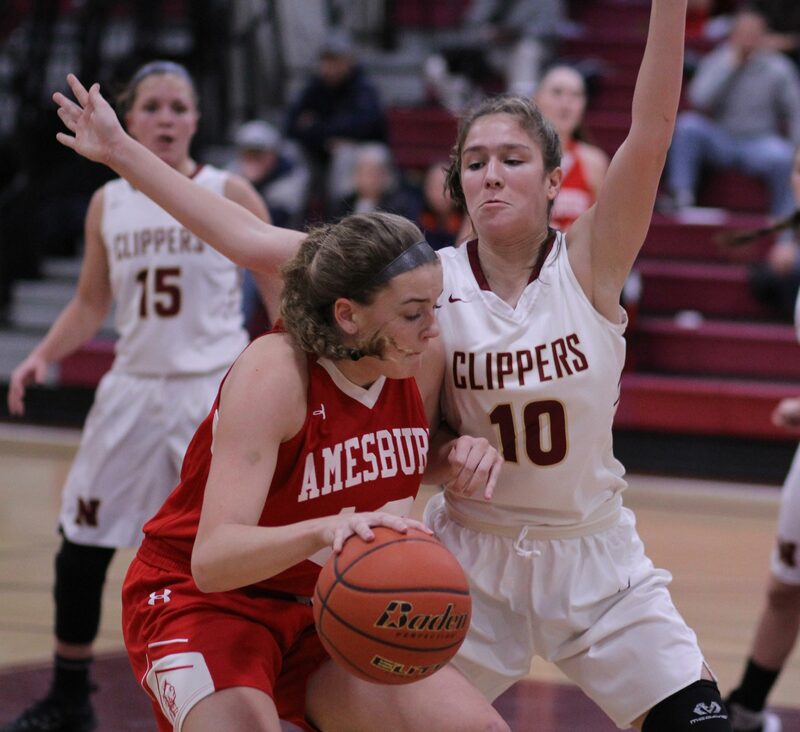 (Newburyport MA) Amesbury won a thriller over Newburyport, 40-39, on a three-point shot by senior Abbie Sartori with twelves second left. 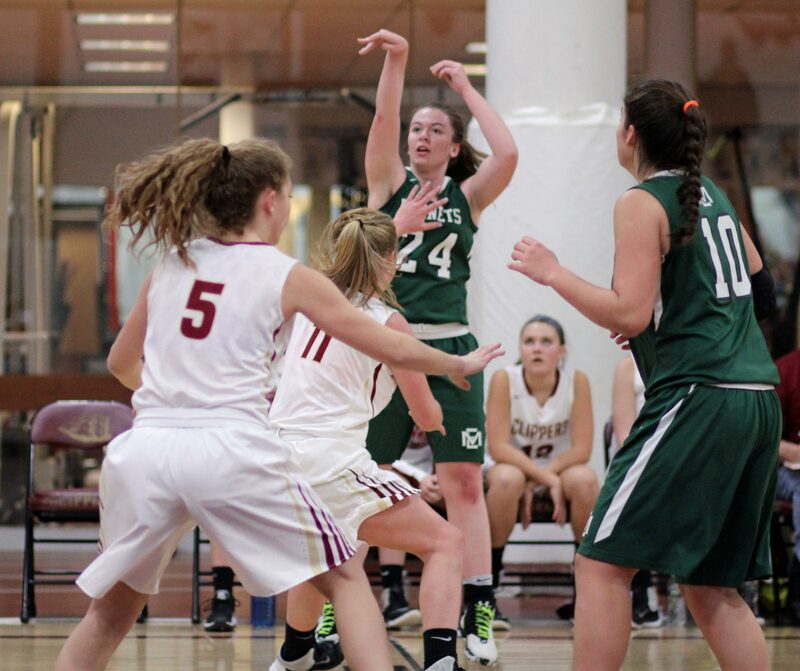 The win was the 13th for the Indians and it erased the sting of their lone loss last week to Pentucket. 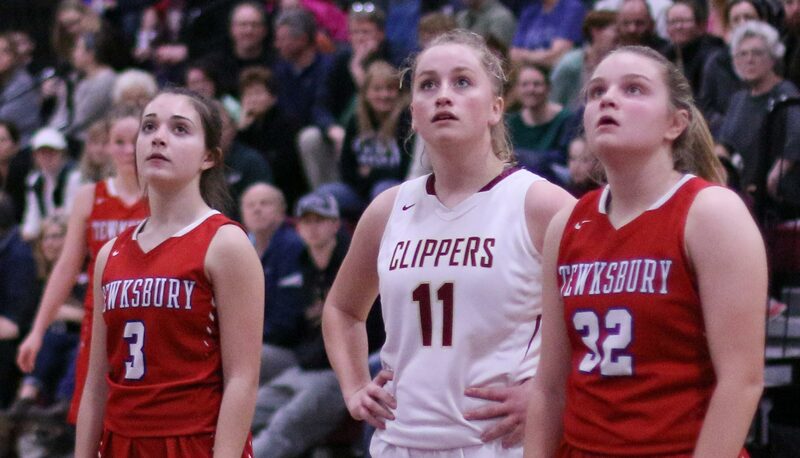 The Clippers made three 3’s in the final quarter and nearly had a fourth in the final seconds after Abbie’s 3-pointer. 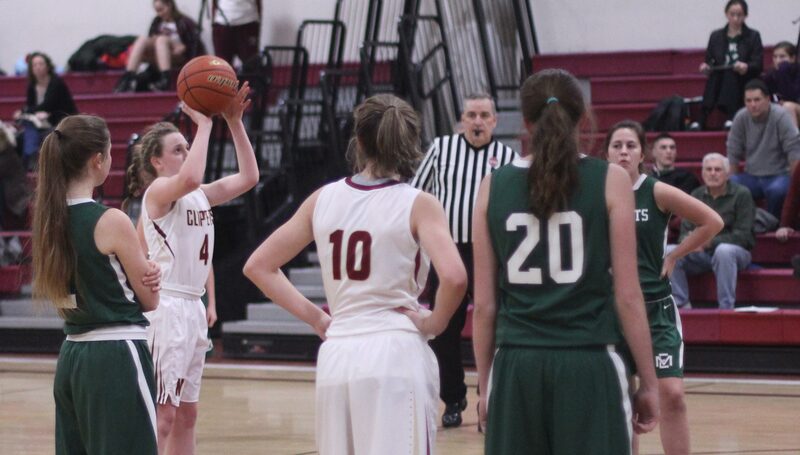 Paige Gouldthorpe had the final shot. She had already made two three’s in the quarter. 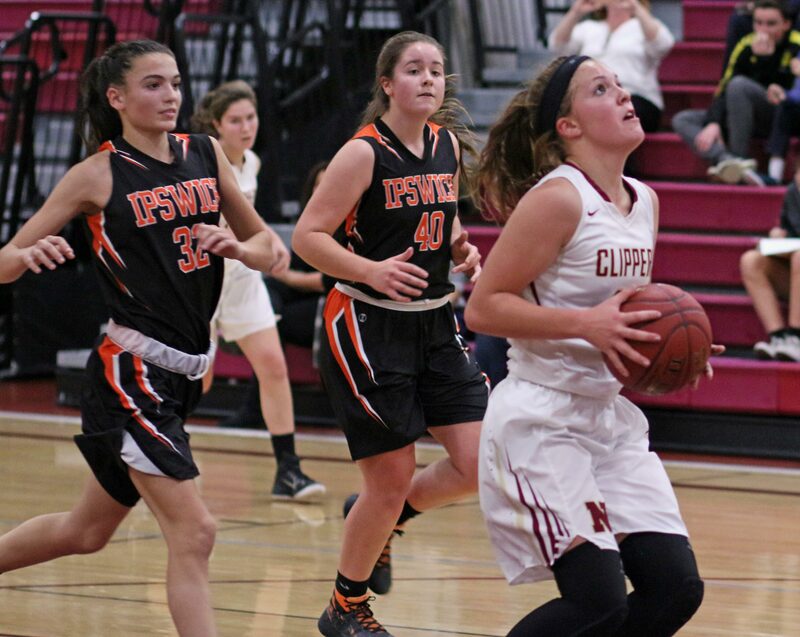 How she could be so wide open must have had AHS coach Matt Willis wondering. 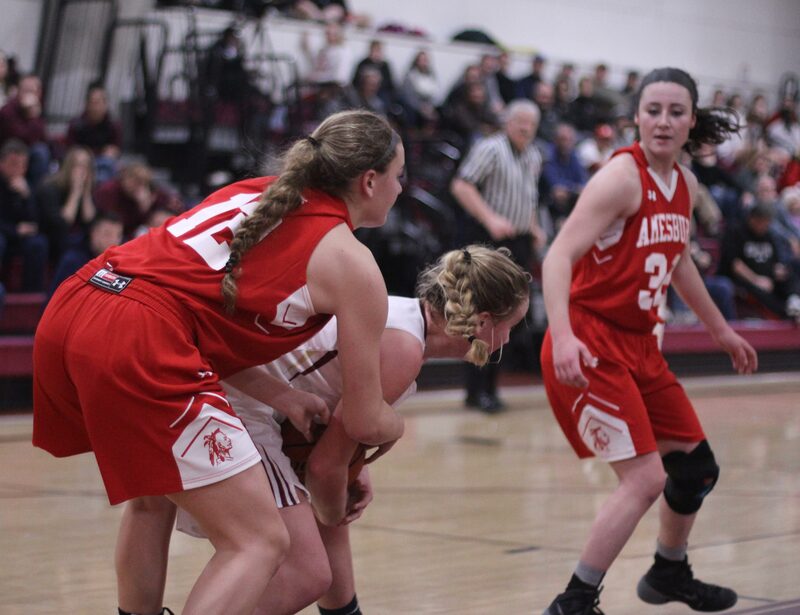 Of course, how Abbie Sartori (11 points), who had a triple in the game, could be wide open near the arc with Amesbury down by two, probably had the same effect on NHS coach Gregg Dollas. This game was not sloppy. The shooting was. 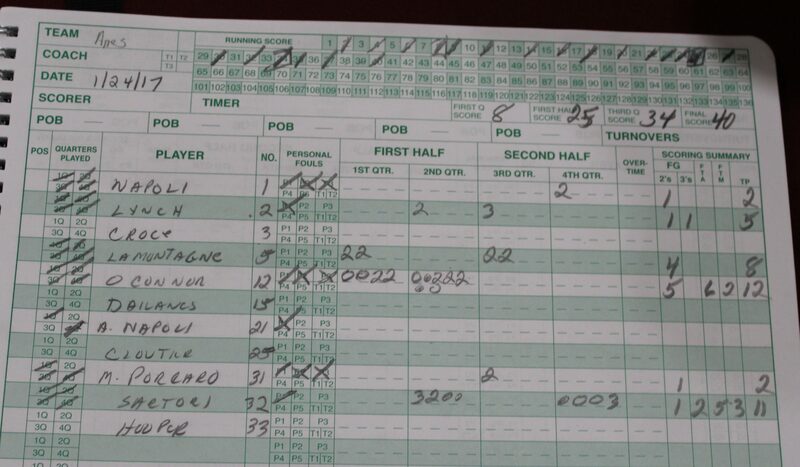 The total on both sides for missed layups, and wild shots in traffic, was large. On this night neither defense was giving much ground and there were few second shots. Free throws? Both teams missed six. 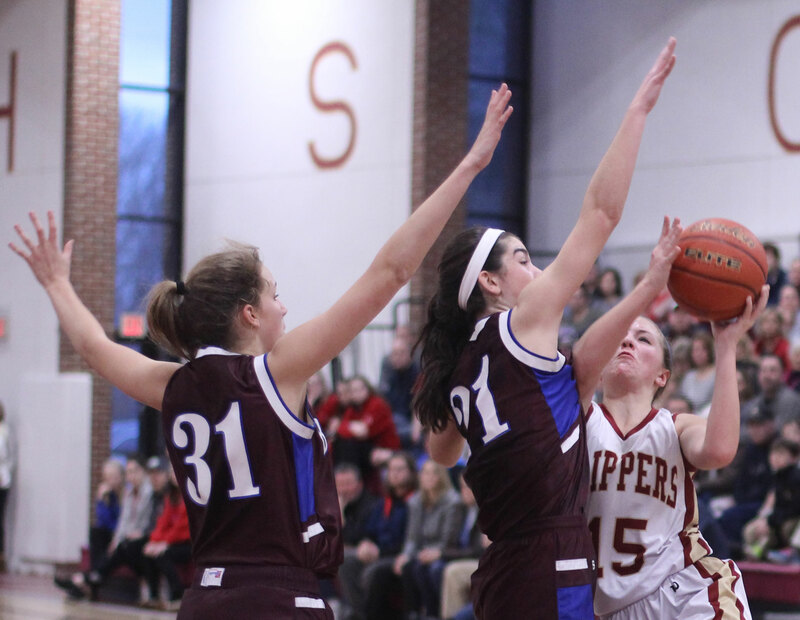 The report of Newburyport’s loss last week to Hamilton-Wenham placed the blame on poor foul shooting. 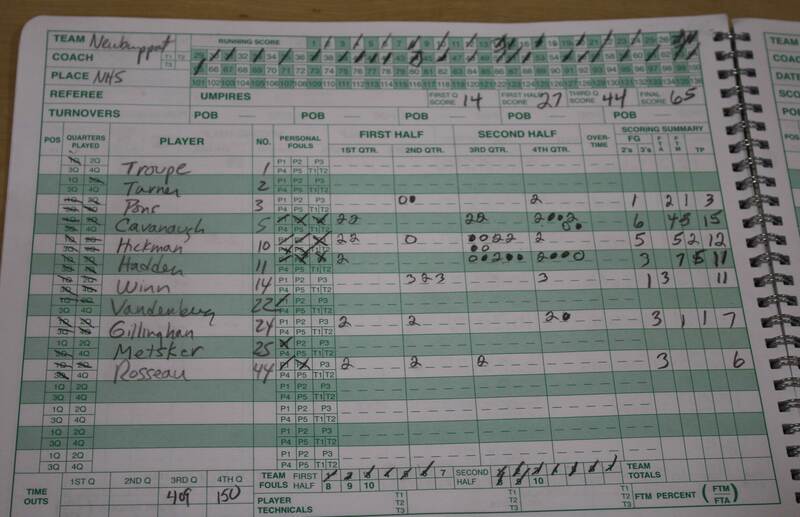 Versus Amesbury the FT shooting wasn’t necessarily poor, just off at the wrong time. Twice in the final thirty seconds the Clippers were at the foul line shooting one-and-one’s with a two-point (39-37) lead. Misses both times (Krysta Padellaro and Katie Hadden). 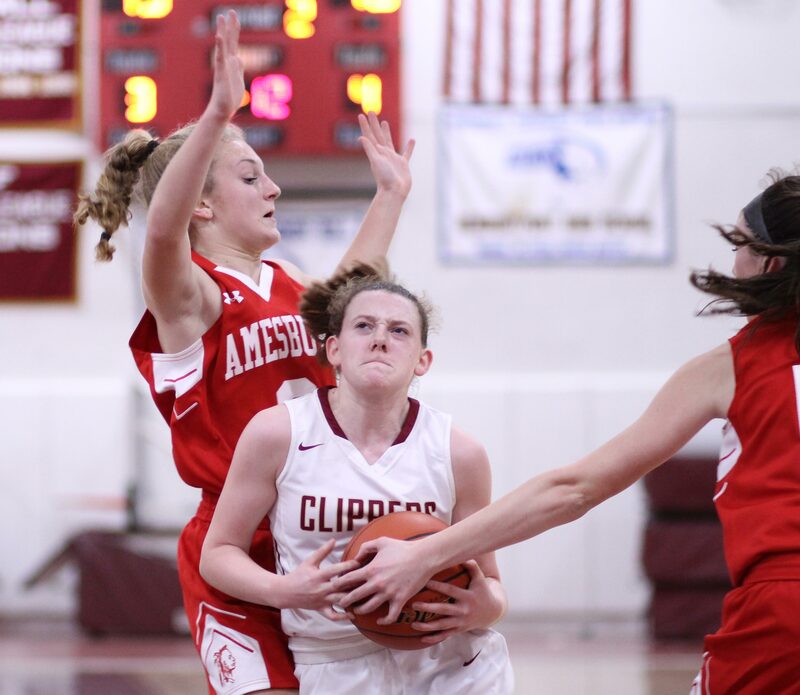 Amesbury turned the ball over after Krysta’s miss but after Katie’s they produced the winning 3-pointer. 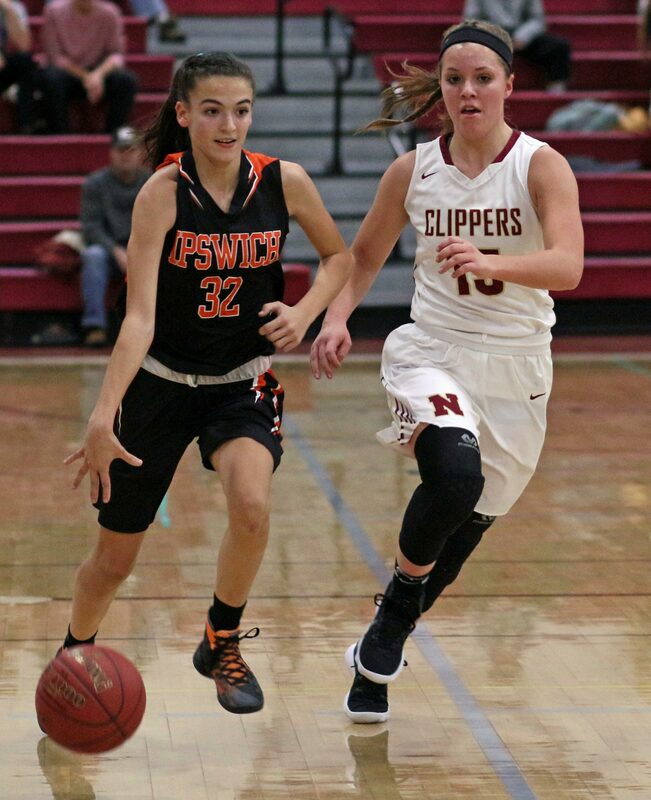 Maddie Napoli found Abbie for the clincher. The Clippers (7-5) fell behind early (4-3) after a Flannery O’Connor drive and stayed there for most of the game. The AHS lead was eight at the half (25-17) and after the third quarter (34-26). 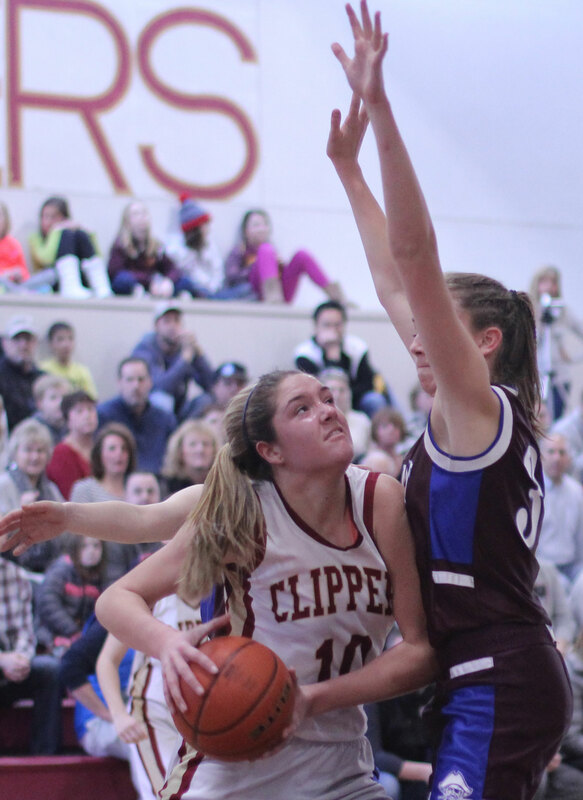 The Clippers hadn’t made a three and the AHS interior defense was limiting most good looks inside. 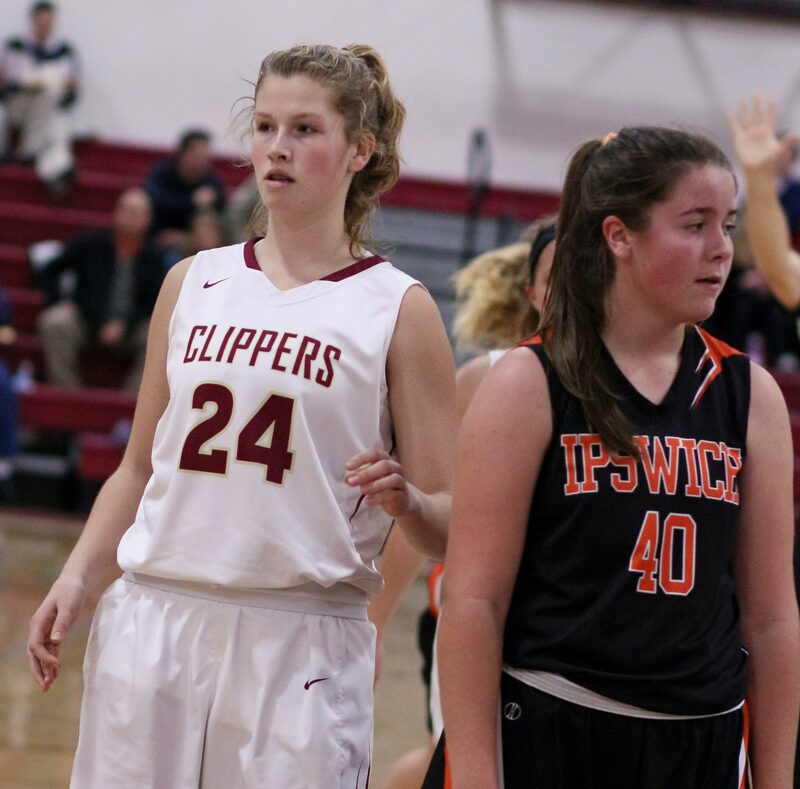 The exception being Anna Hickman (14 points) who managed four layups through heavy AHS traffic in the second quarter. 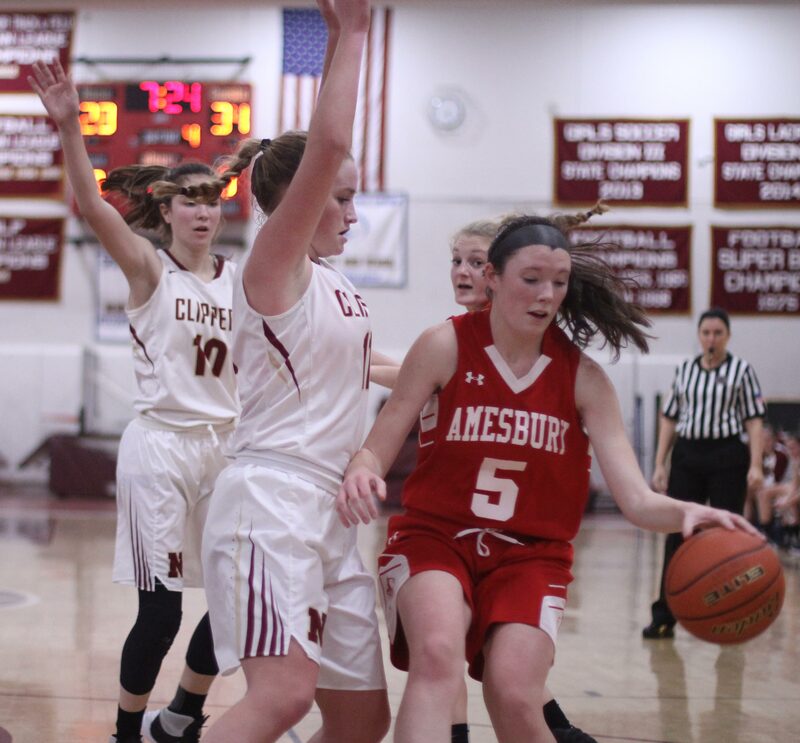 That Amesbury eight-point lead looked safe entering the final quarter. But it wasn’t. 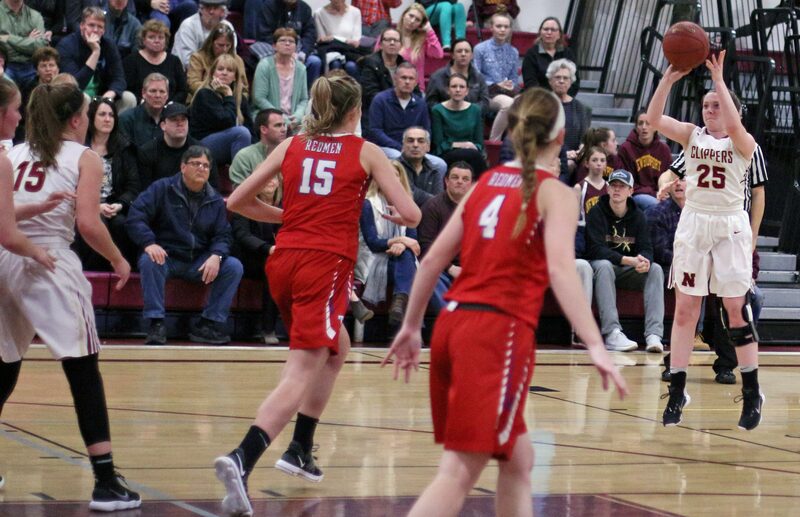 The home team put a 13-1 run together to grab a 39-34 lead with 2 ½ minutes left. Now who’s in control! It’s the Clippers. In the 13-1 run, the Clippers made shots from everywhere. 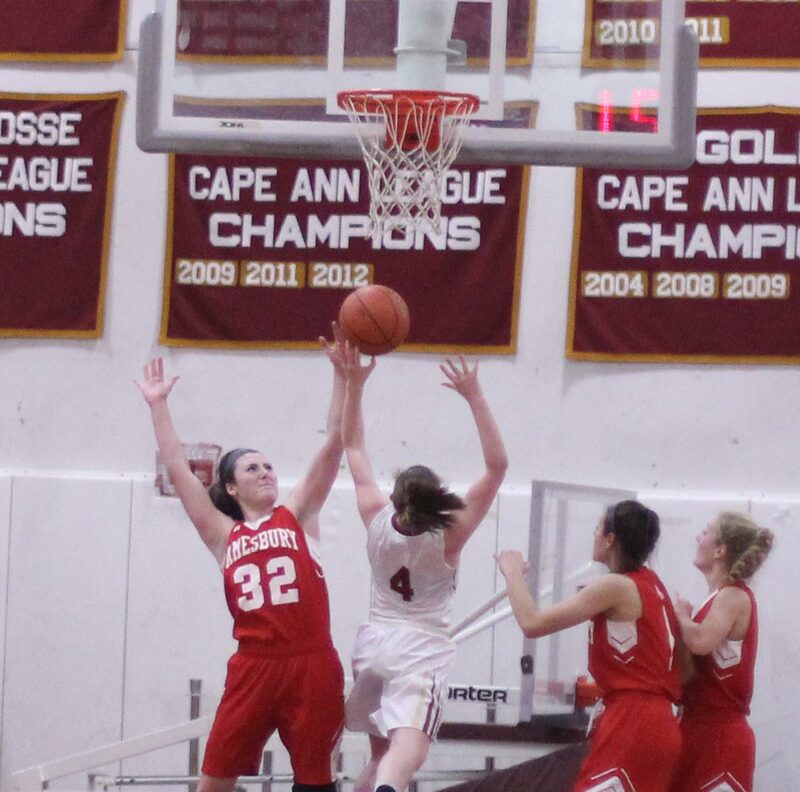 Krysta Padellaro had a layup. 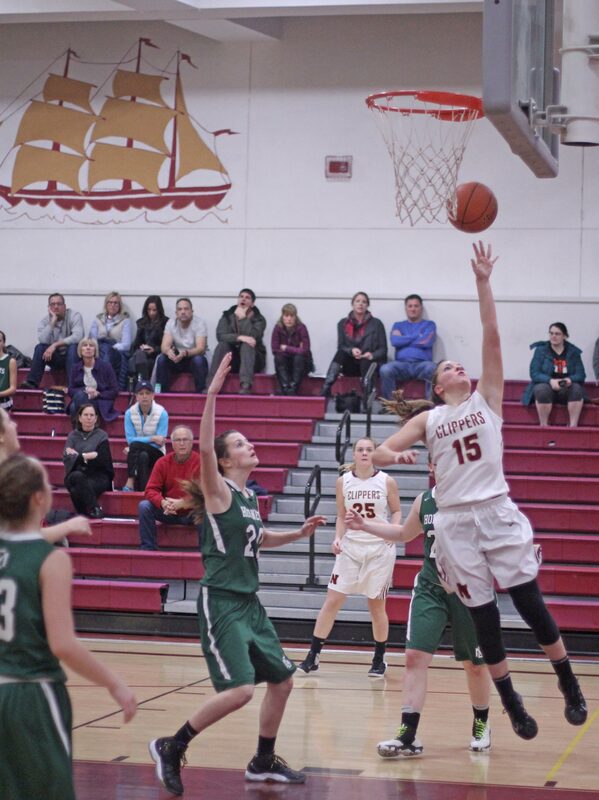 Katie Hadden a jump shot. And then there were the three’s: one by Anna Hickman, and two by Paige Gouldthorpe. 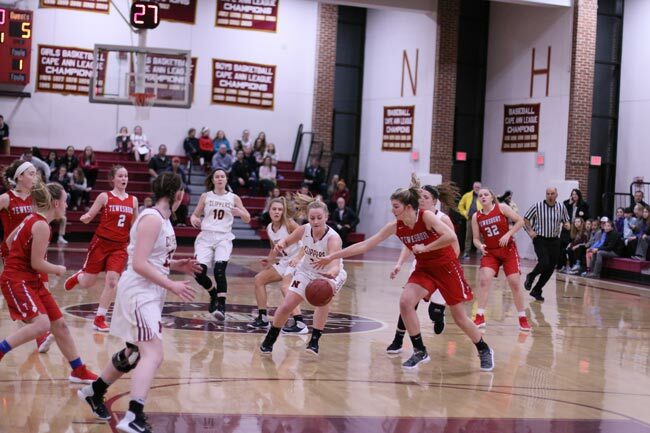 Amesbury was in trouble but was able to recover as Newburyport did not score a single point over the final 2 ½ minutes. The Clippers had chances but they couldn’t cash them on this night. I did think that Paige’s late 3-point try was a good bet after one of her three’s earlier in the quarter had come from the same spot. But not this time. 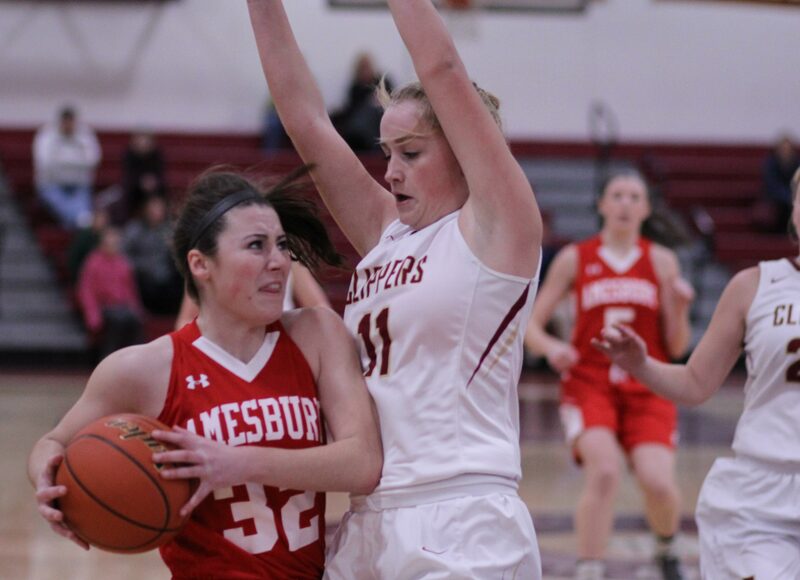 Amesbury had nine unanswered in the second quarter to get a ten-point (18-8) lead. 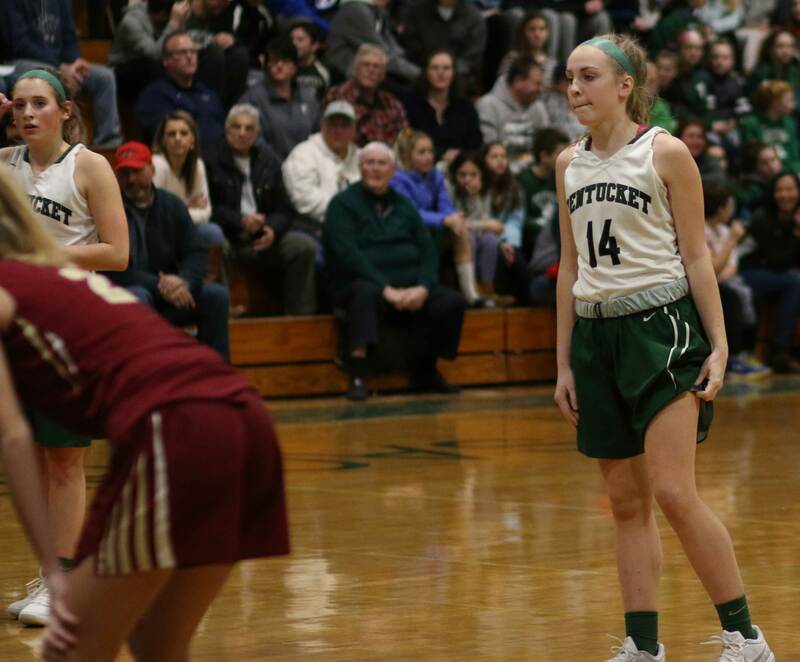 A jump shot and a three by Abbie Sartori, a jump shot by Chelsea Lynch, and full-court drive by Flannery O’Connor (12 points) did the damage for AHS. 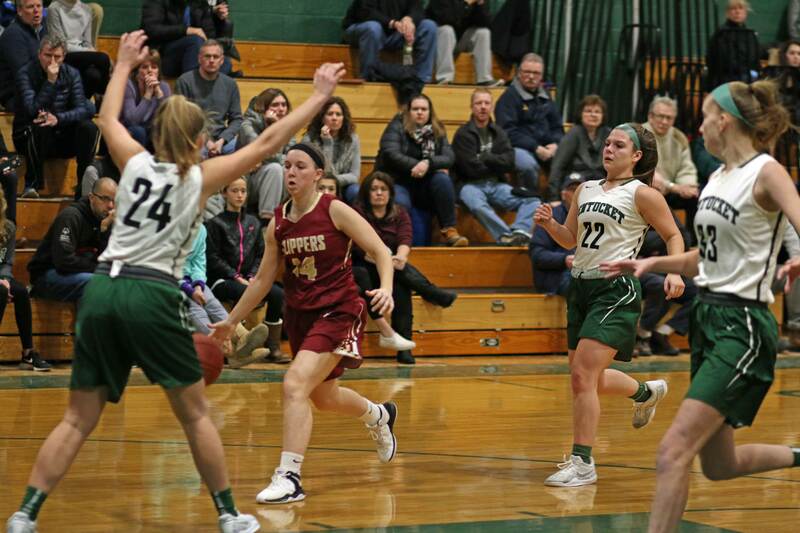 Both Julia LaMontagne and Mikayla Porcaro turned up layups in the final thirty seconds of the third quarter. Mikayla’s just beat the buzzer. 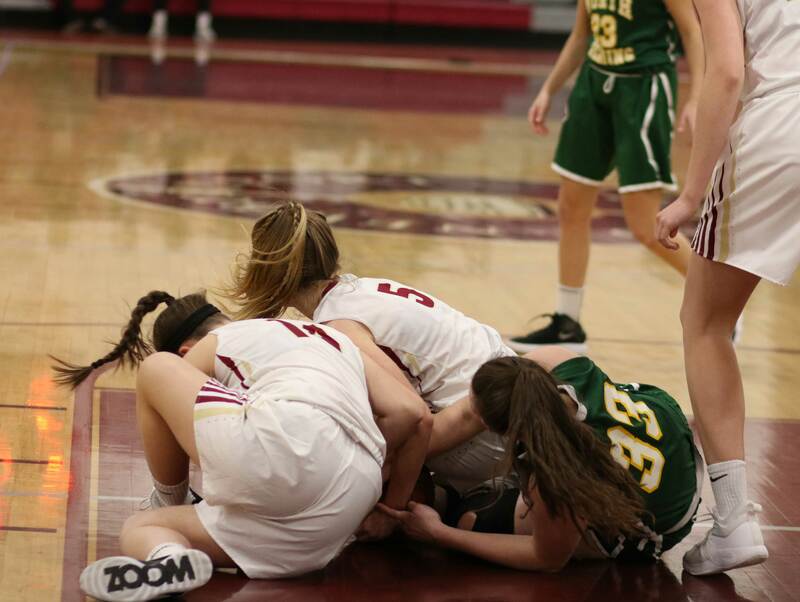 Krysta was injured the in the 4th quarter but a quick tape job by the NHS trainer enabled the junior to be on the floor in crunch time. Paige Gouldthorpe easily transitioned from singer to starter. 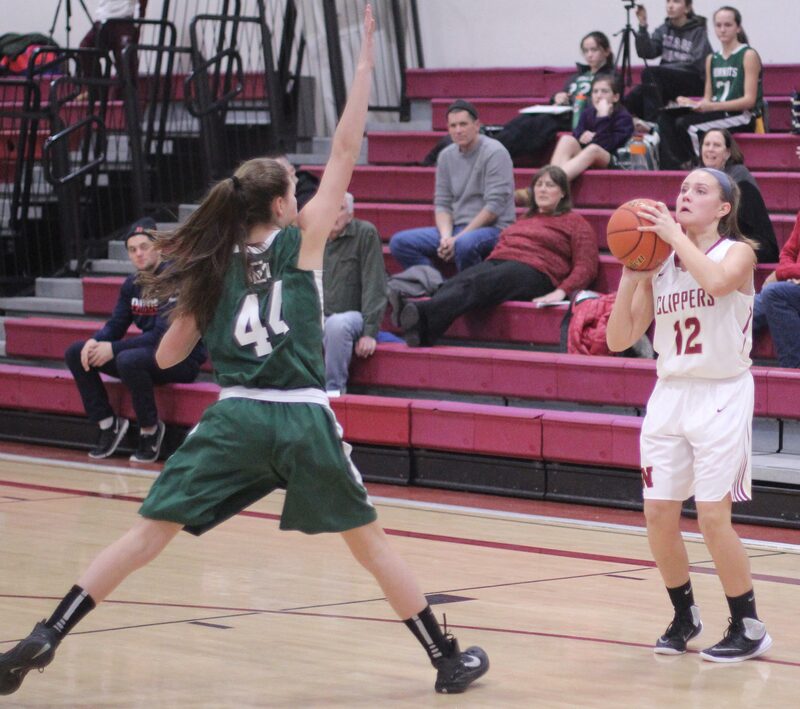 The big surprise for me was seeing Krysta and Maddie Napoli held to only two points each. 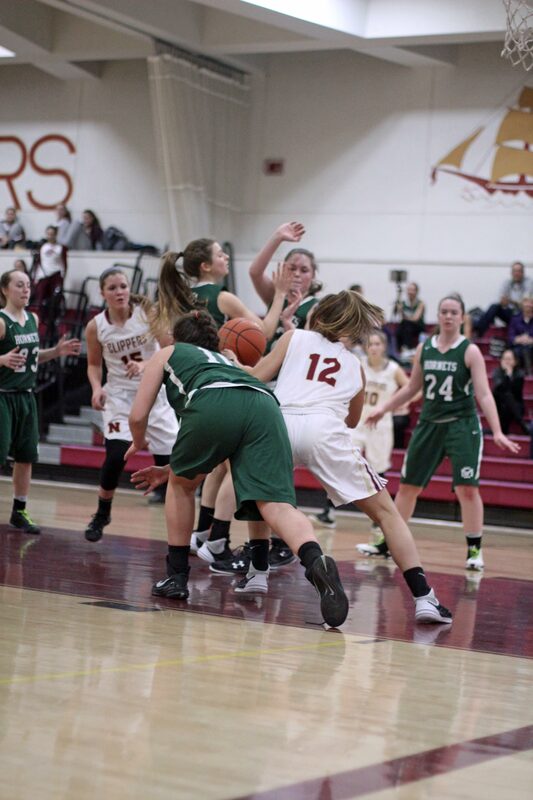 Maddie did a good job of denying passes to Krysta. 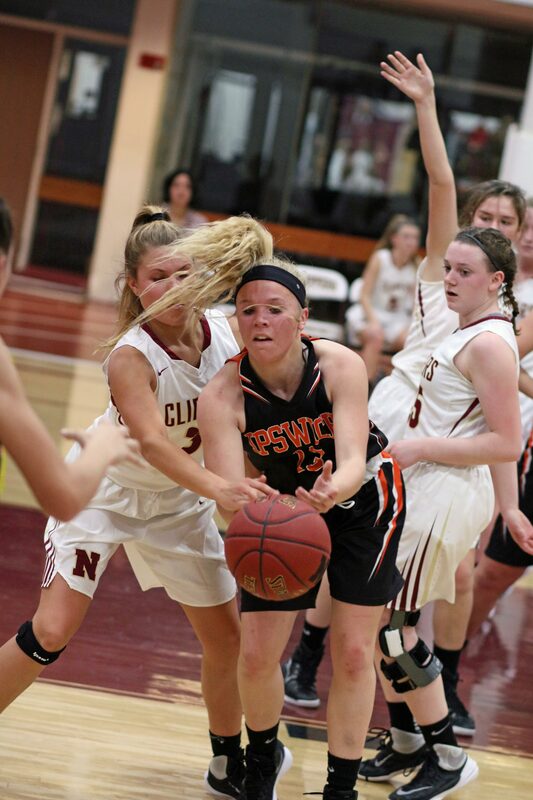 I saw her do the same thing to Triton’s Tessa Lafrance in AHS’s win over Triton. NHS now has three straight losses. 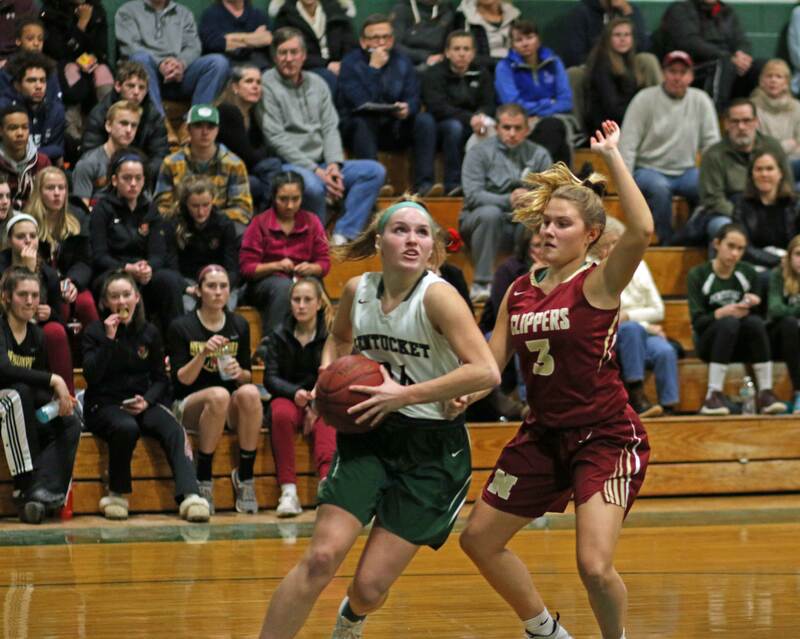 They face a tough one (Pentucket) away on Friday night. 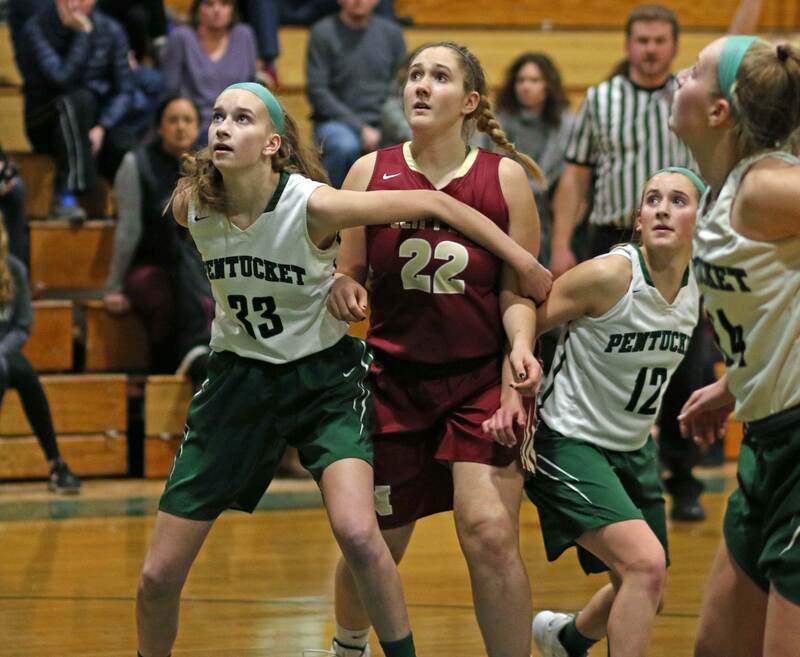 Later they will get Pentucket at home. 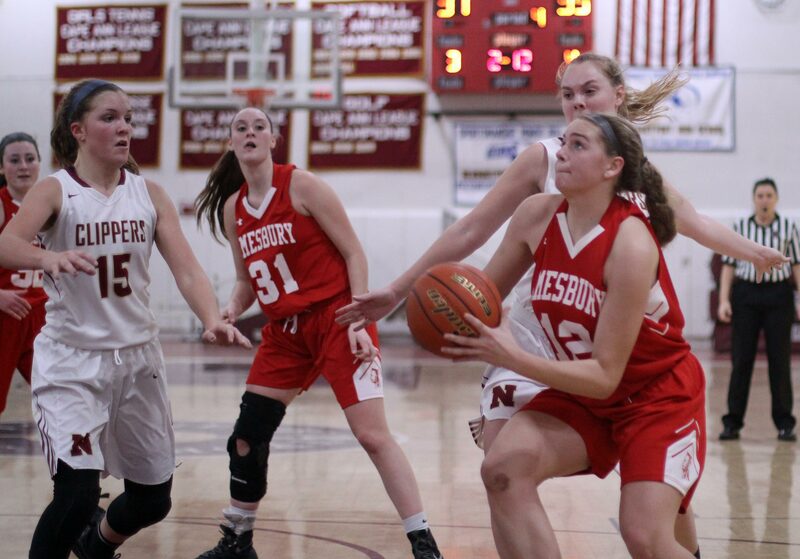 Amesbury hosts Manchester-Essex on Friday night. In the games ahead, the Indians will face four teams that they have already beaten this season. 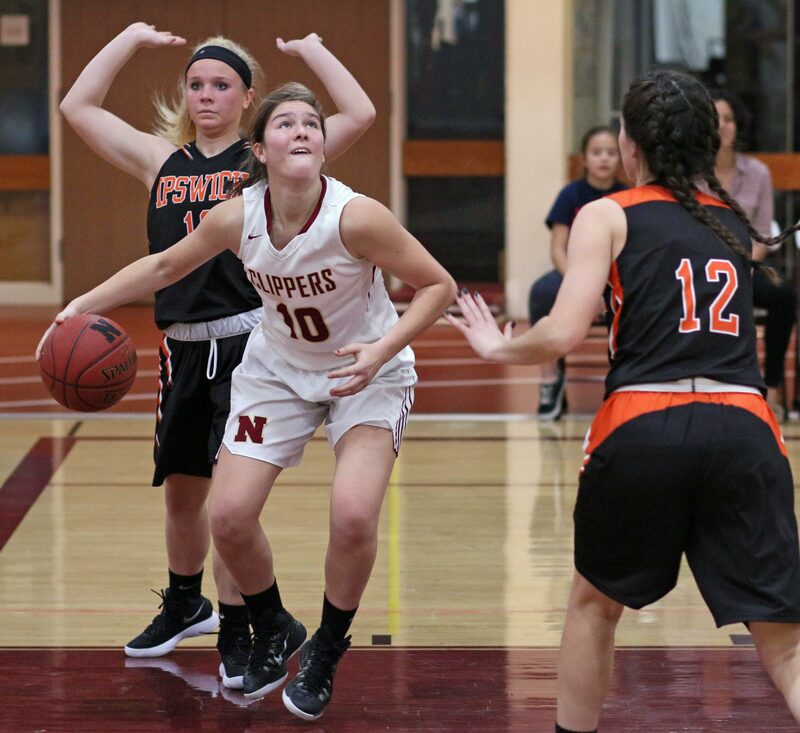 You have to like their chances of being a near-the-top seed in Division 3 North come tourney time. (Newburyport MA) What a second quarter! 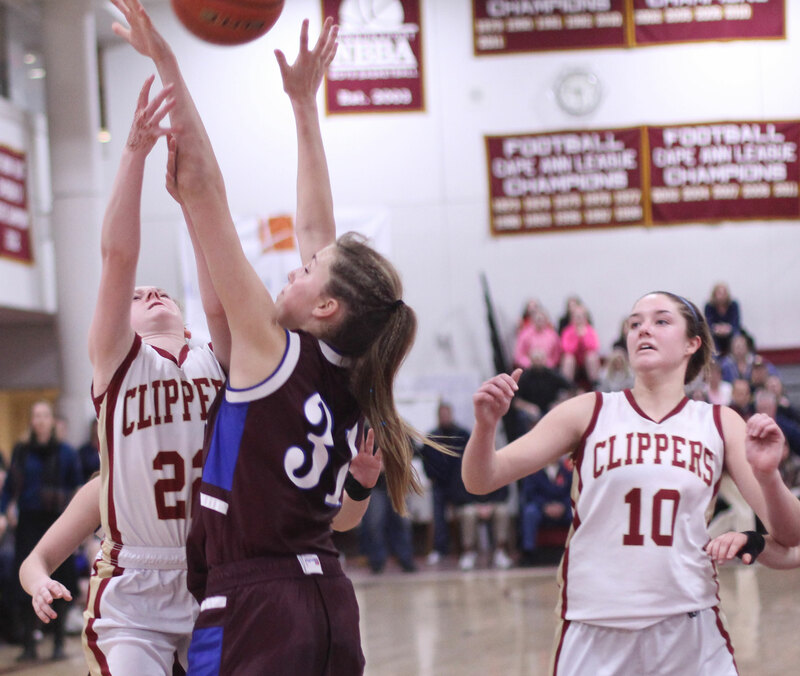 The Newburyport Clippers took the visiting Manchester-Essex Hornets apart in that second frame and took the suspense over the outcome along with it. 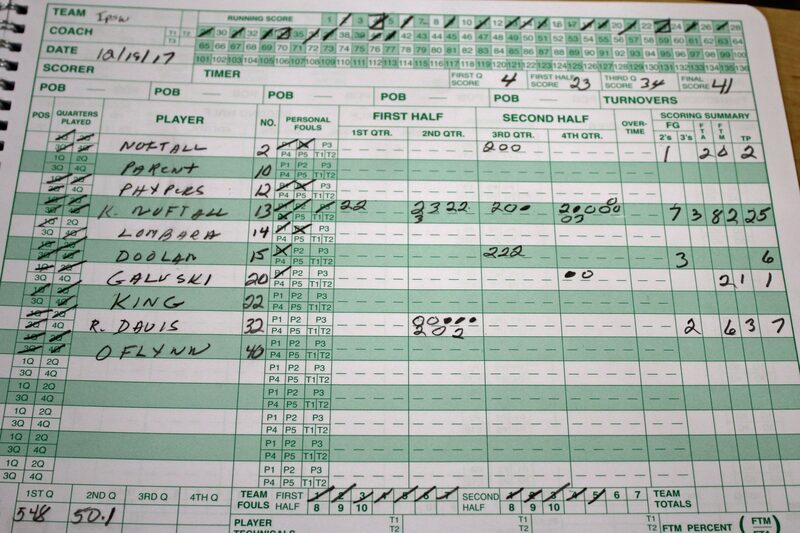 The final was 62-47 for this Tuesday night game but if you were on hand one minute into the second quarter you saw the Hornets with a 16-12 lead. 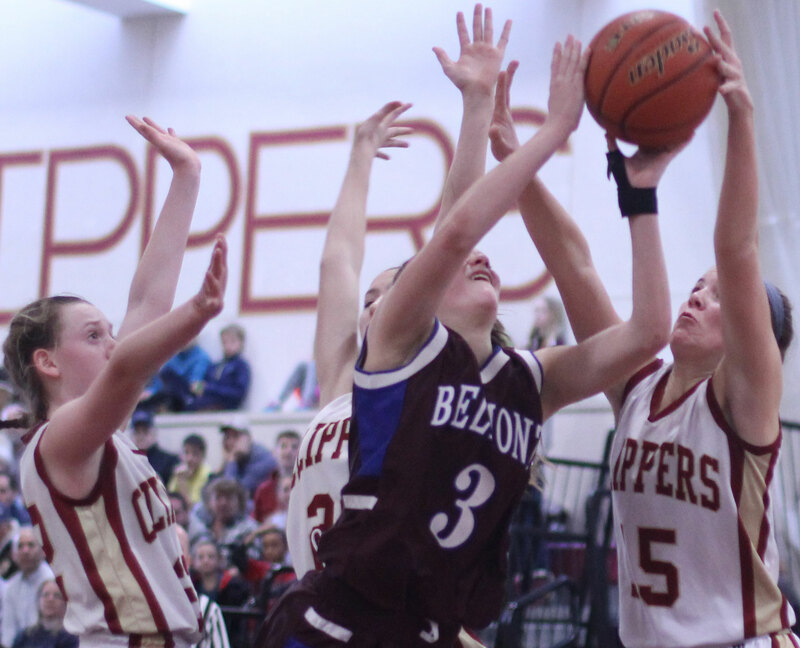 One minute into the second half, the Clippers (6-2) were in front, 37-20. That was a 25-4 segment for the home team. How did they do it? After a period of allowing the Hornets, especially Melanie Carter, to get to the basket the Clippers protected the paint better. They also rebounded better. 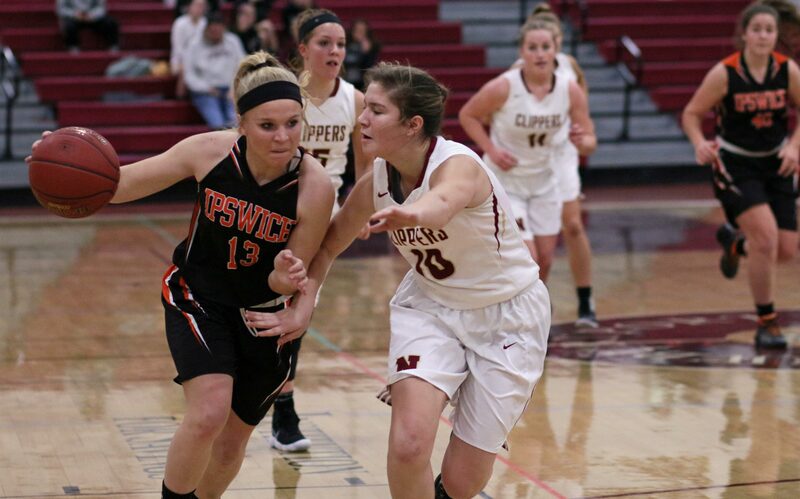 Good defense transferred into up-tempo offense and layups down the other end. 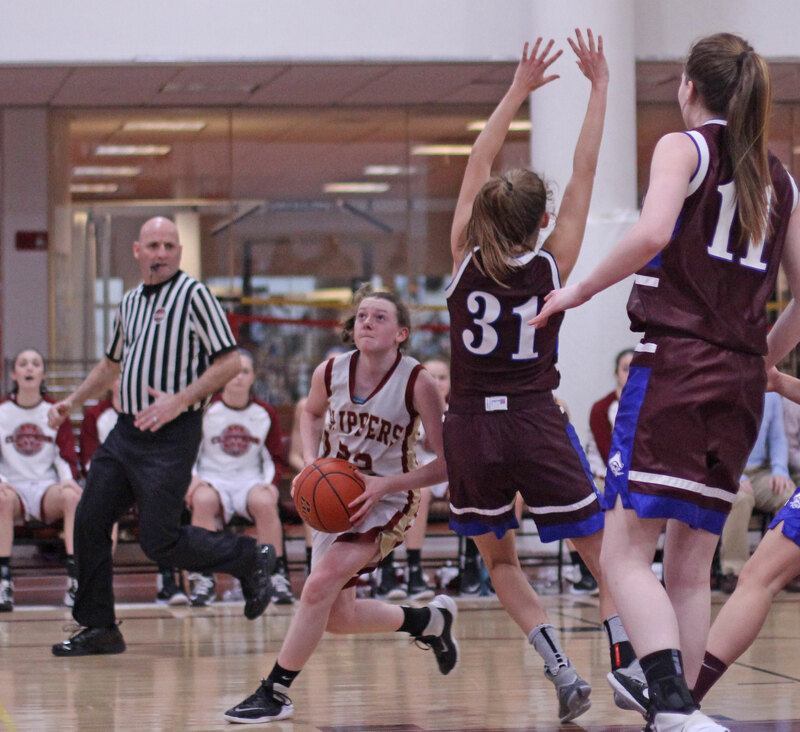 Even in their half-court offense Newburyport found ways to get to the basket for points or foul shots. 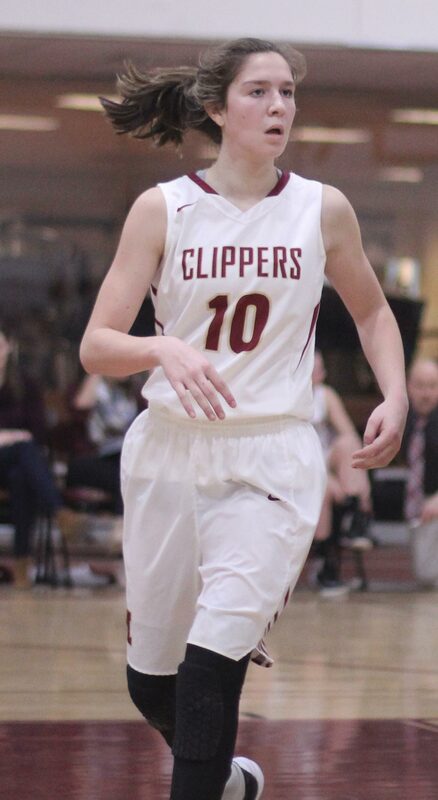 Anna Hickman (20 points) was a standout on both ends of the court. 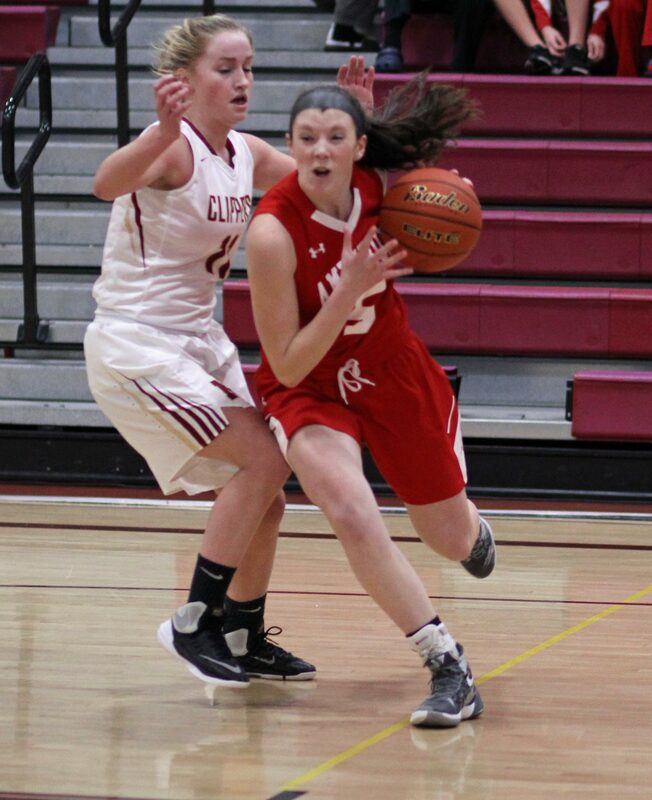 Her tight D on ME point-guard Kaitlyn O’Connell impacted the Hornets ability to run their offense. 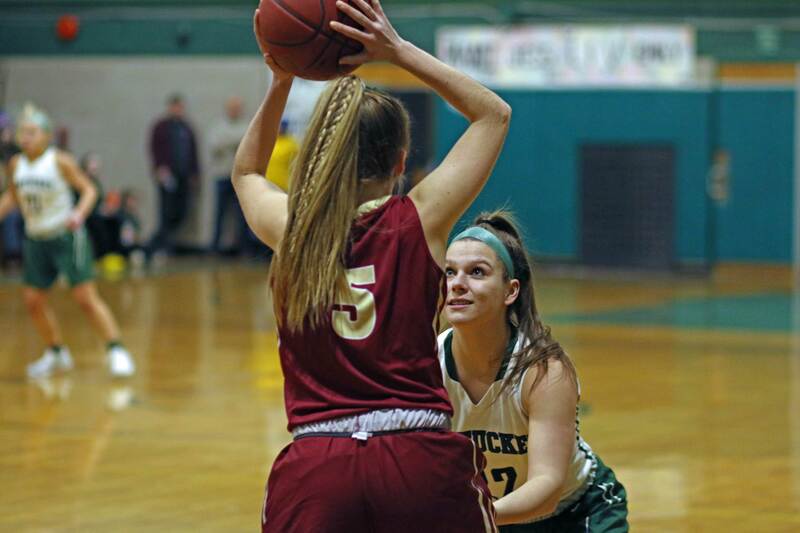 The sophomore forced turnovers and was part of numerous NHS fast-breaks. 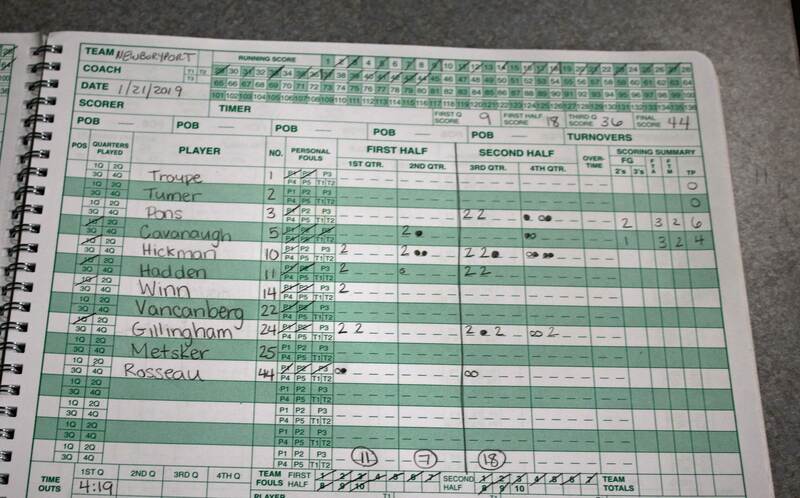 Anna drained two 3’s, made four other baskets, and took ten free throws. Quite a performance against a team that came in undefeated after six games. 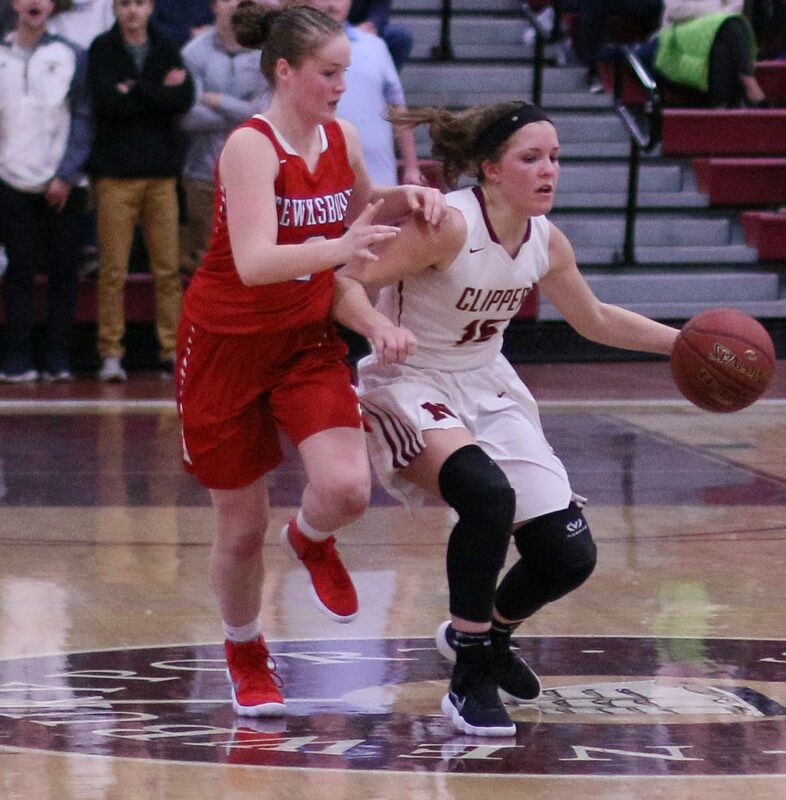 Krysta Padellaro (17 points) had a big hand in the win as well, She put up eleven points in the breakaway second quarter. 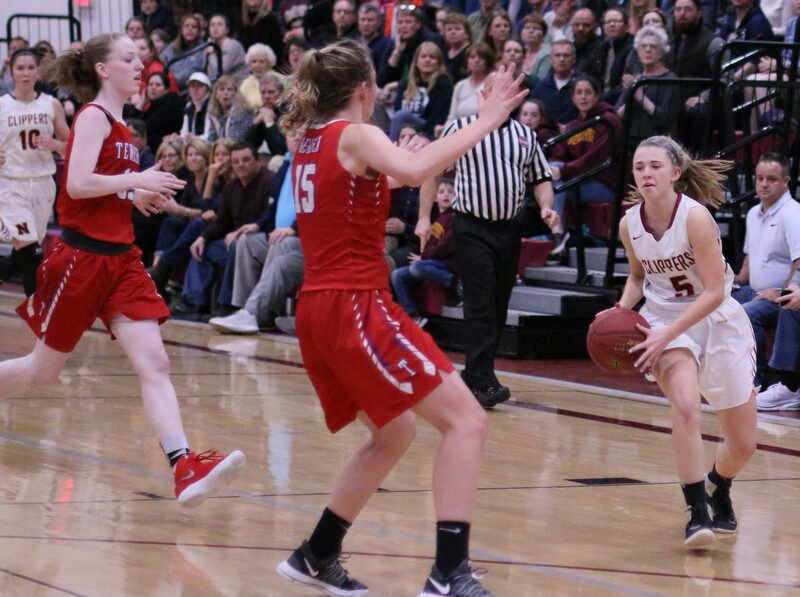 The ME deficit was only four (22-18) five minutes into the second quarter before the NHS junior dribbled the length of the court for one layup, drained a triple, and drove in for another layup. 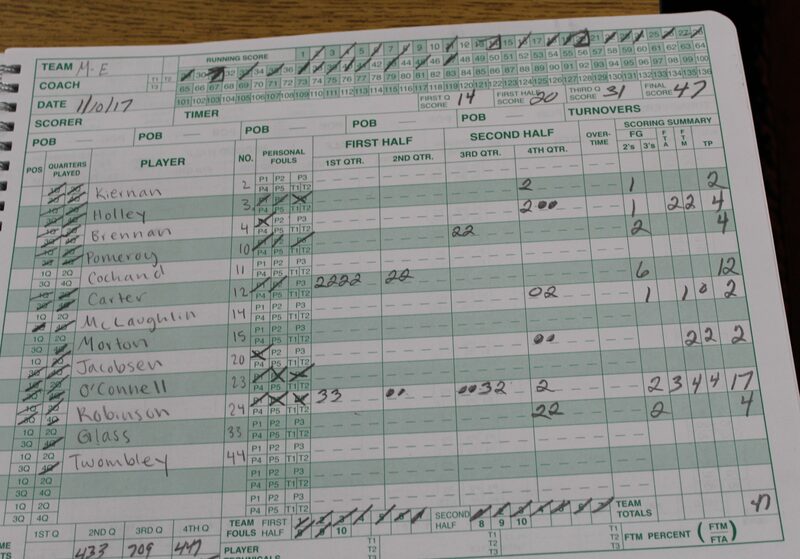 Those seven unanswered, extended the NHS margin to eleven (29-18). 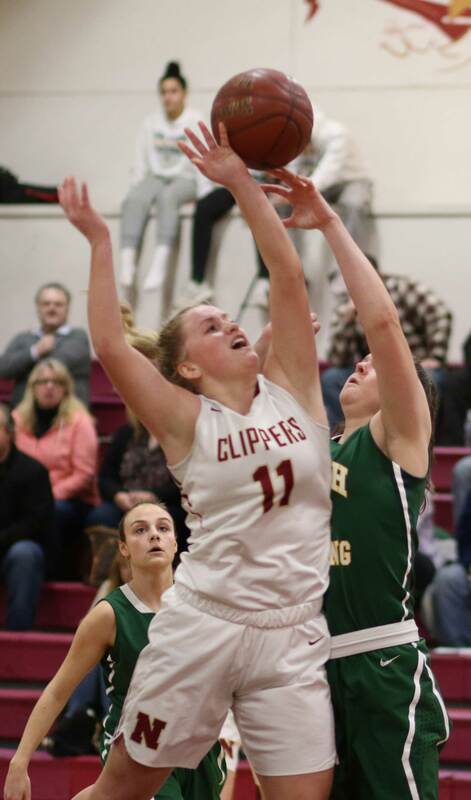 Two free throws by Sarah Robinson (17 points) stopped the bleeding temporarily but the Clippers came back with eight points in a row (Olivia Olson layup & 2 free throws, Krysta jump shot, Anna layup) and the lead was seventeen (37-20) one minute into the second half. The teams played even the rest of the way. 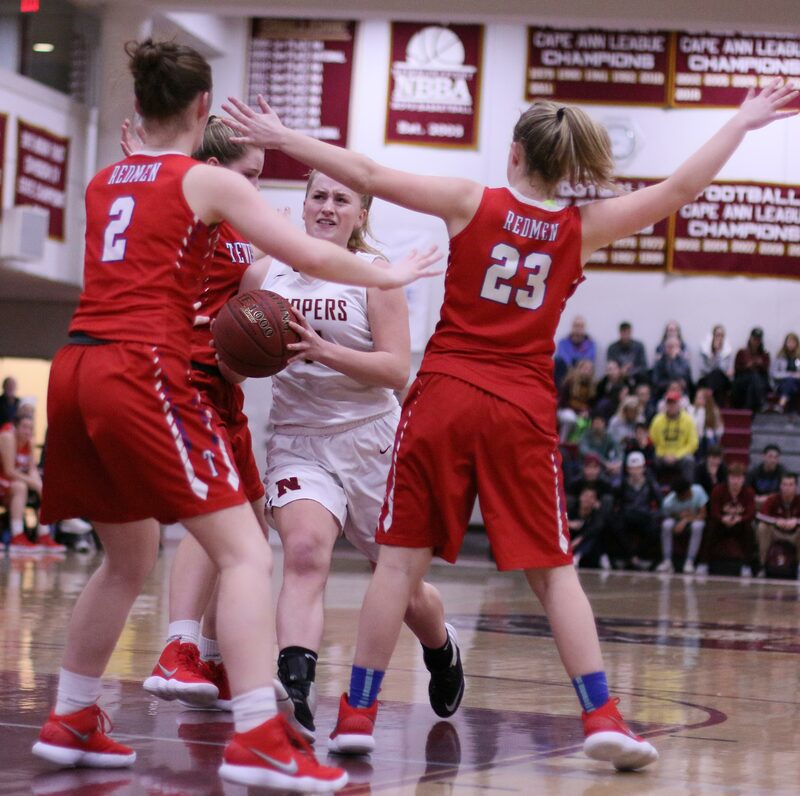 Manchester-Essex used a zone defense. Their trouble was getting back fast enough to get into it. The Clippers were eager to run after every defensive rebound and collected layups at the other end by doing it. 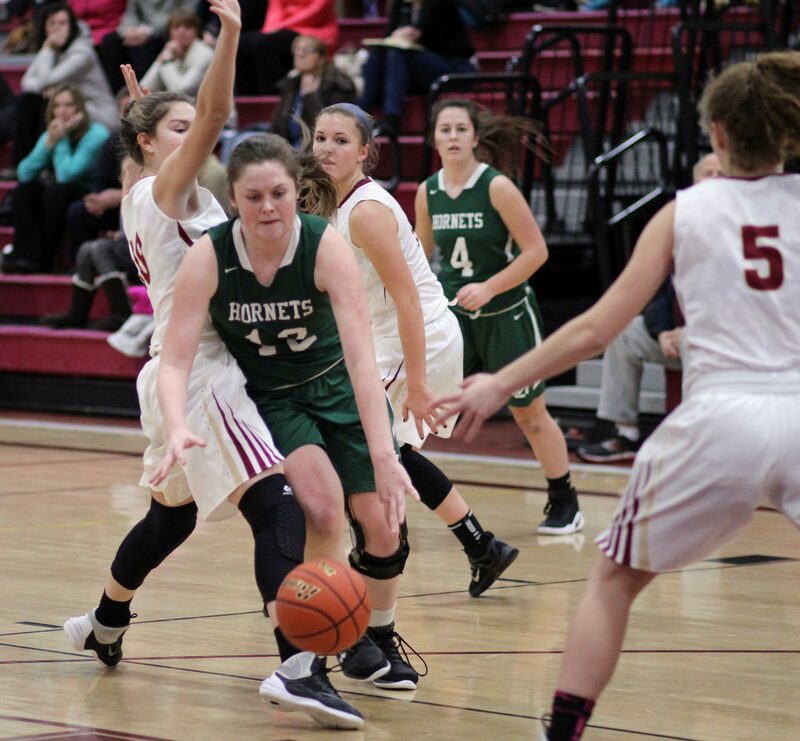 The Hornets (6-1) were coming off an impressive win at home (39-37) against Pentucket on Friday night. 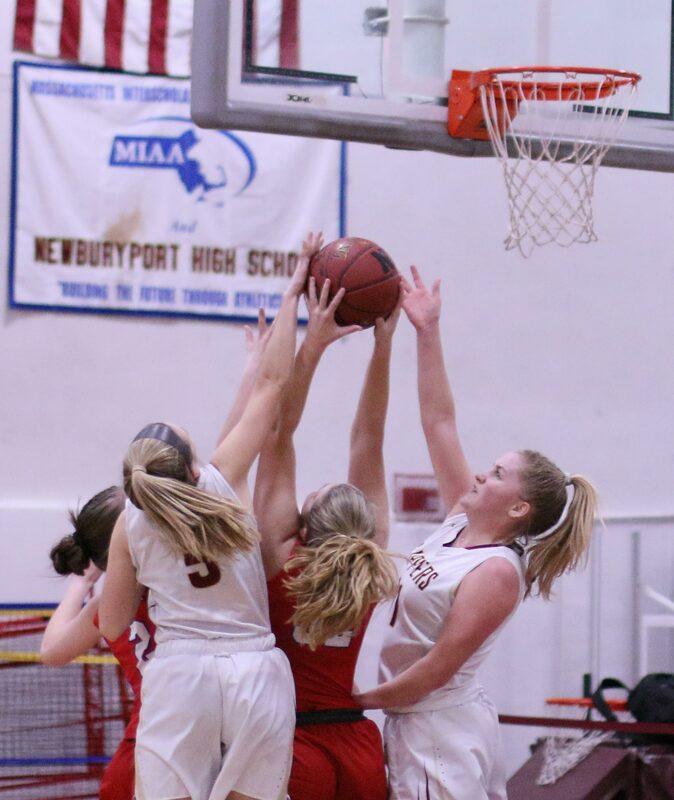 Newburyport ended up with eighteen turnovers including four straight starting the game. ME finished with sixteen turnovers including five in their disastrous six-point second quarter. 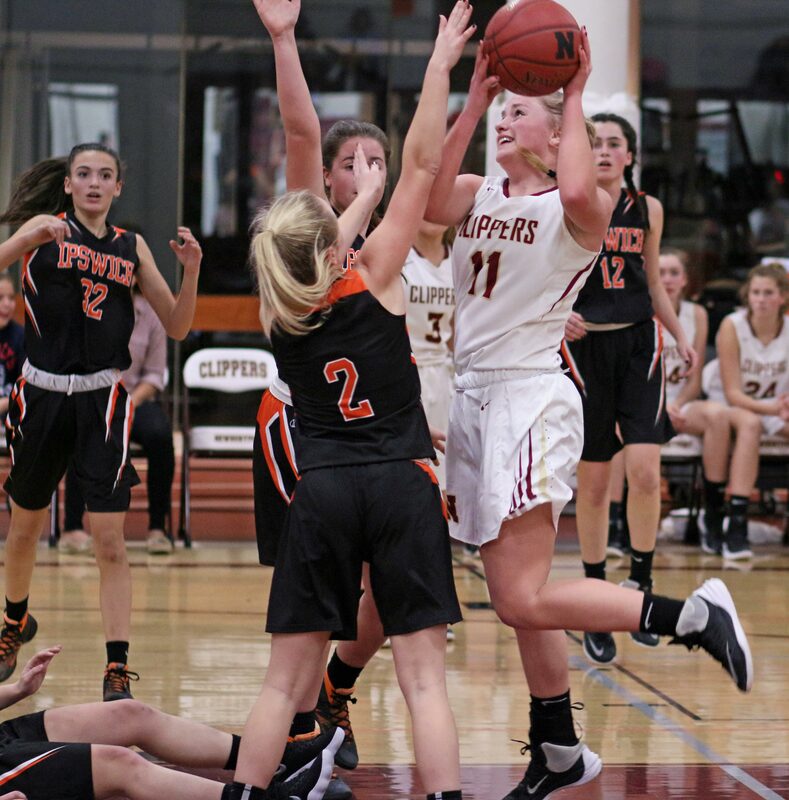 Beth Castantini was on the Newburyport bench. She was a 1000-point scorer for the Clippers back in the day. 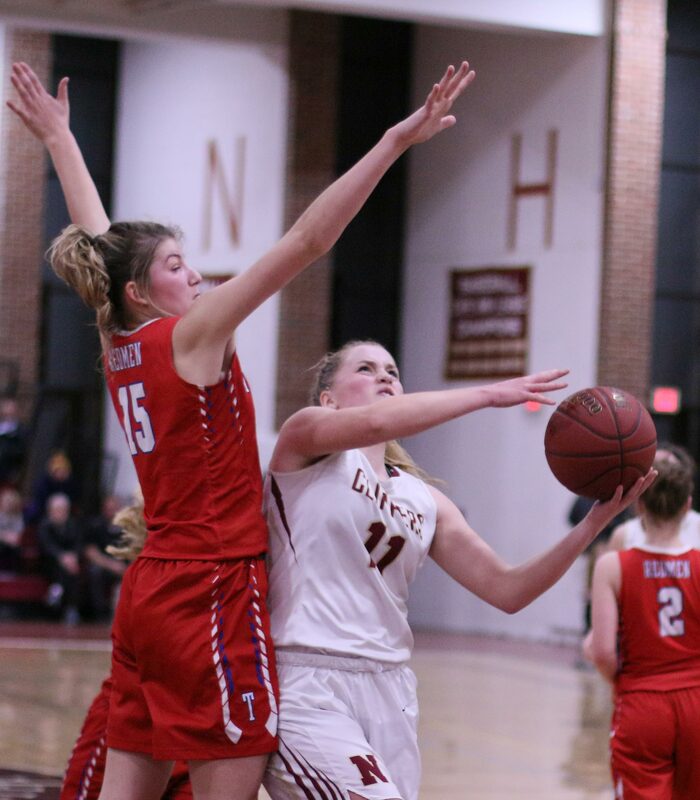 (Newburyport MA) Senior Emily Pettigrew (22 points) reached 1000 points but it wasn’t enough as Belmont eliminated Newburyport, 49-47, in the D2 North quarterfinals on Saturday afternoon. This game was foul-infested from the get-go as both teams applied pressure wherever they could and contact was frequent. Whistles blew and players were helped up. Coaches questioned every call and fans from both sides offered regular evaluations of the three officials. Smooth it wasn’t! This game came down to the final minute with a win still within reach of either squad. 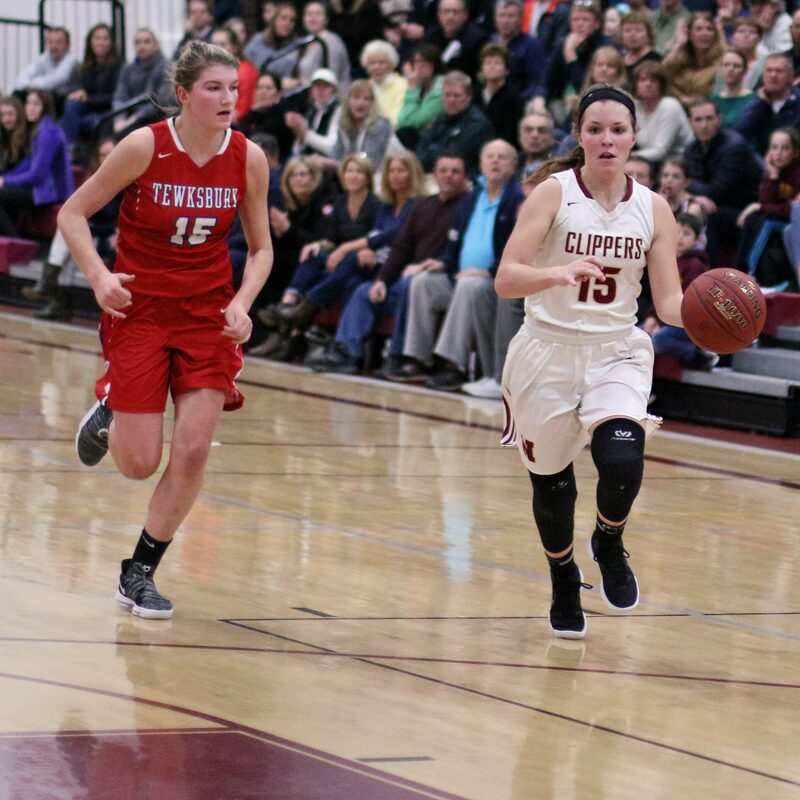 Emily Pettigrew had given the Clippers (17-4) a one-point lead (47-46) with 1:15 left. 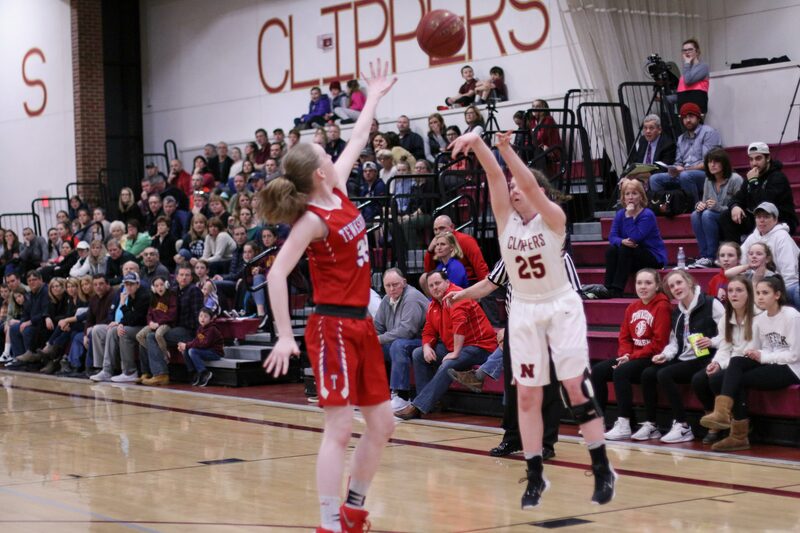 That would be the last productive possession for Newburyport. 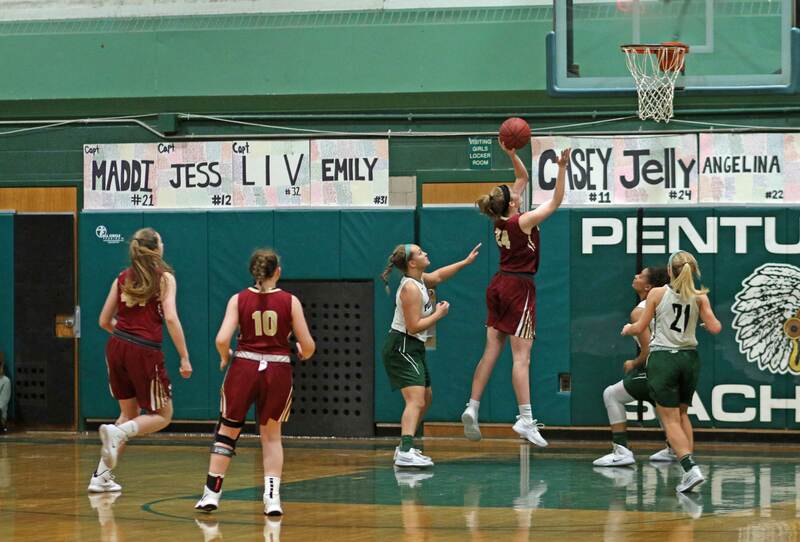 Their final three, point-producing opportunities ended with a block by Jess Giorgio, a turnover, and another block by Jess Giorgio. 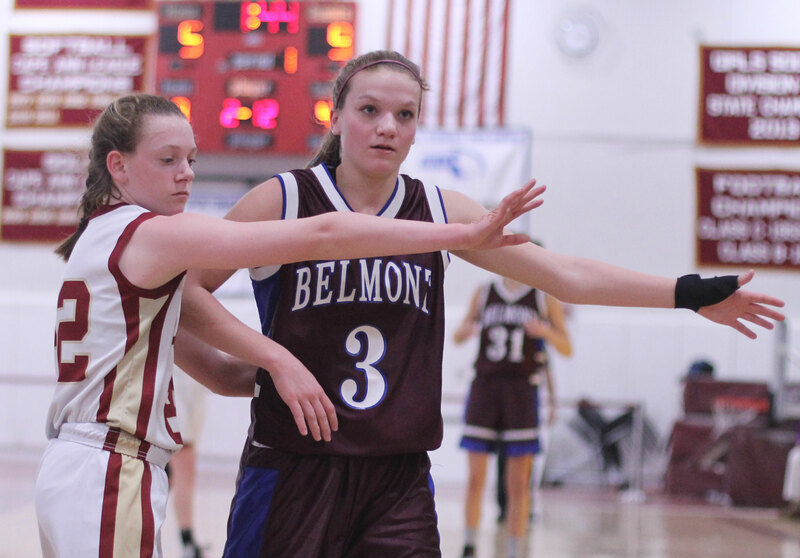 In Belmont’s last two possessions they were at the foul line both times. 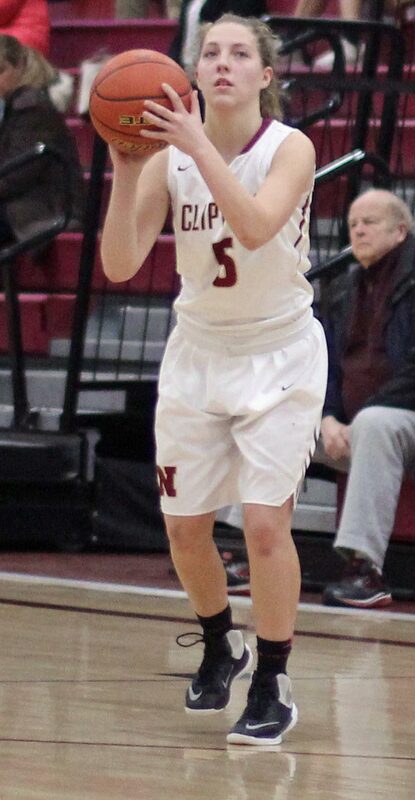 Senior Irini Nikolaidis (11 points) completed a 5-for-5 quarter sinking two attempts and freshman Megan Tan made one of her two tries. 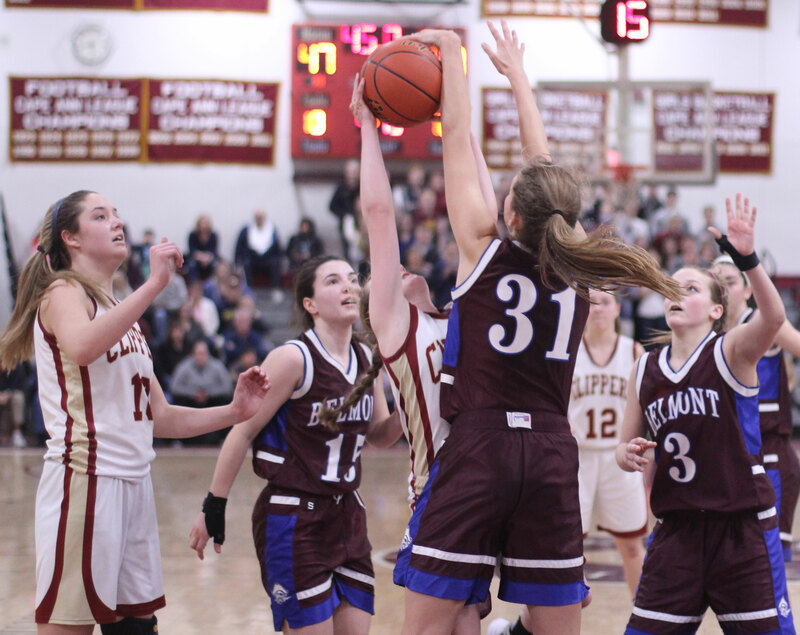 Making those three free throws gave Belmont the points they needed to earn the right to face the winner of the Arlington Catholic/Melrose game on Tuesday in the D2 North semi-finals. 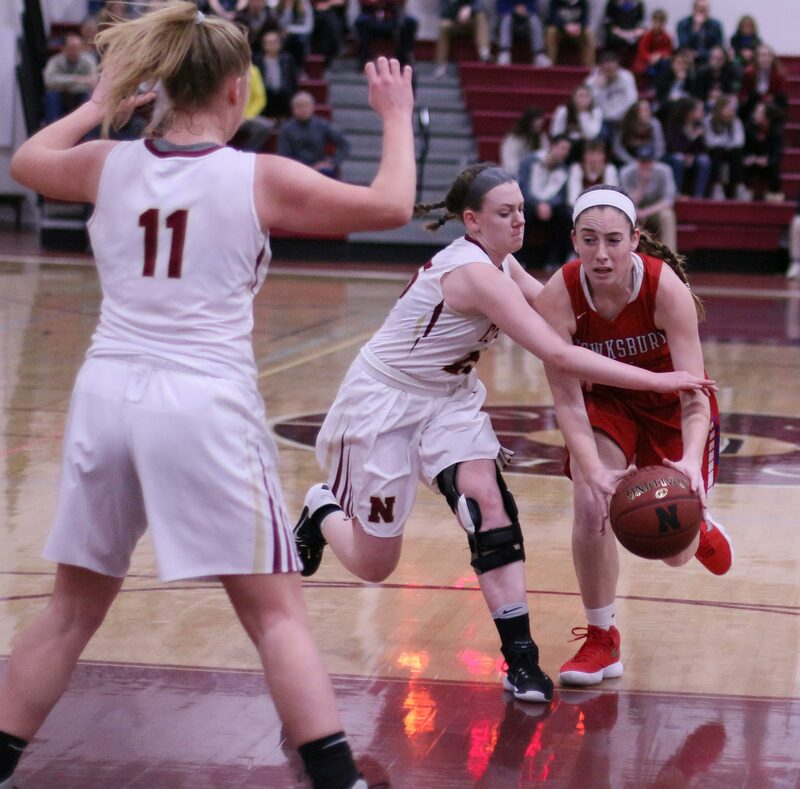 The Marauders reached the D2 North semi-finals last season but lost to Watertown. 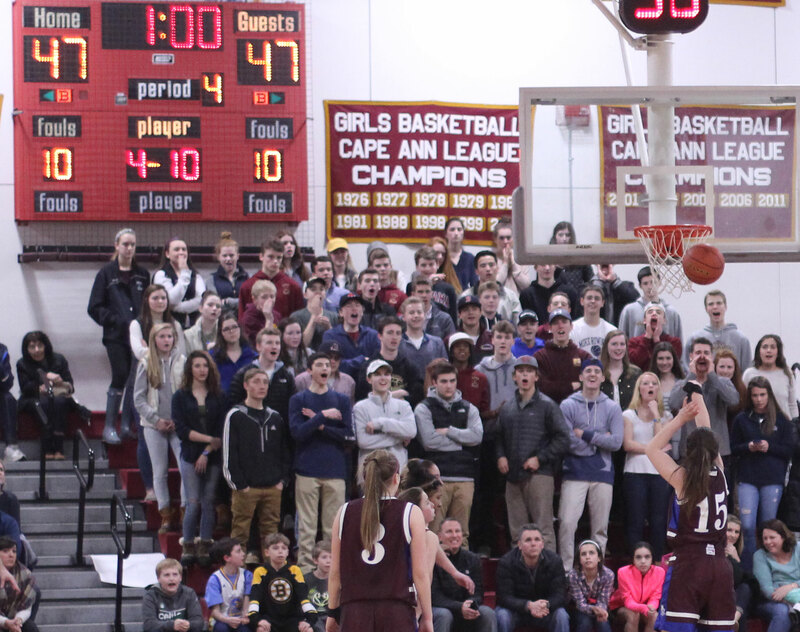 Anyone in attendance who is reading so far is surely wondering what has taken me so long to get to the real reason Newburyport is not still alive in the tournament: free throw shooting. 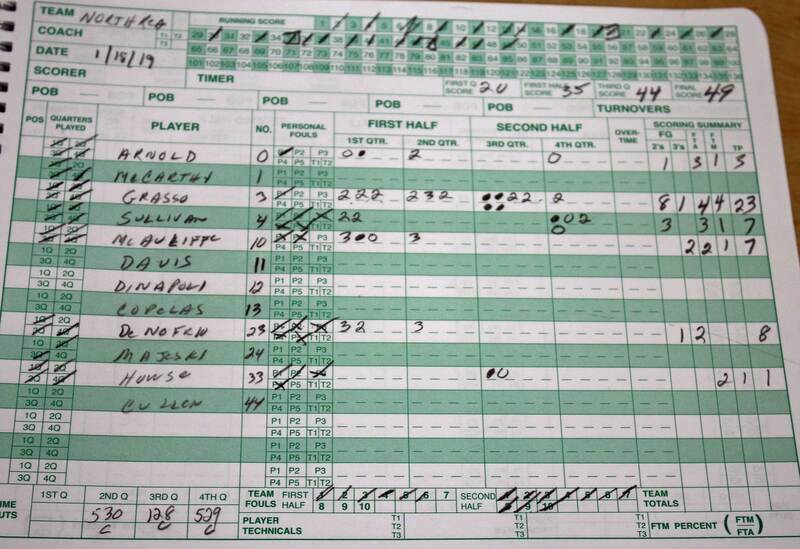 When one team misses fourteen free throws you can easily imagine that they would be in trouble. Not in this game. 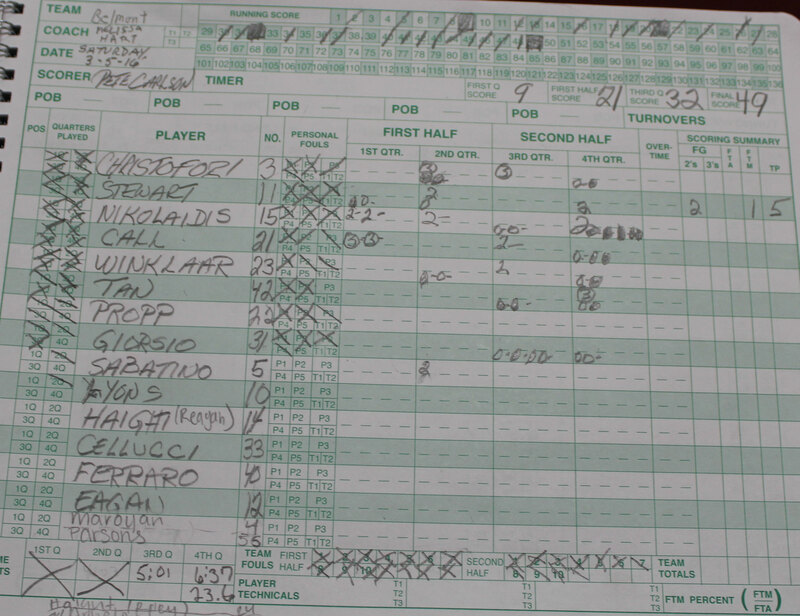 Those fourteen misses belonged to Belmont (18-for-32) and they won by two points. Newburyport? Good news? They made 8-of-9 in the final quarter. Bad news? 10-for-32 in the other three quarters. Worse news? 5-for-19 in the second quarter. The total missed free throws by the Clippers was twenty-three and think of the “Could have been’s” they’ll think about for a while over that. 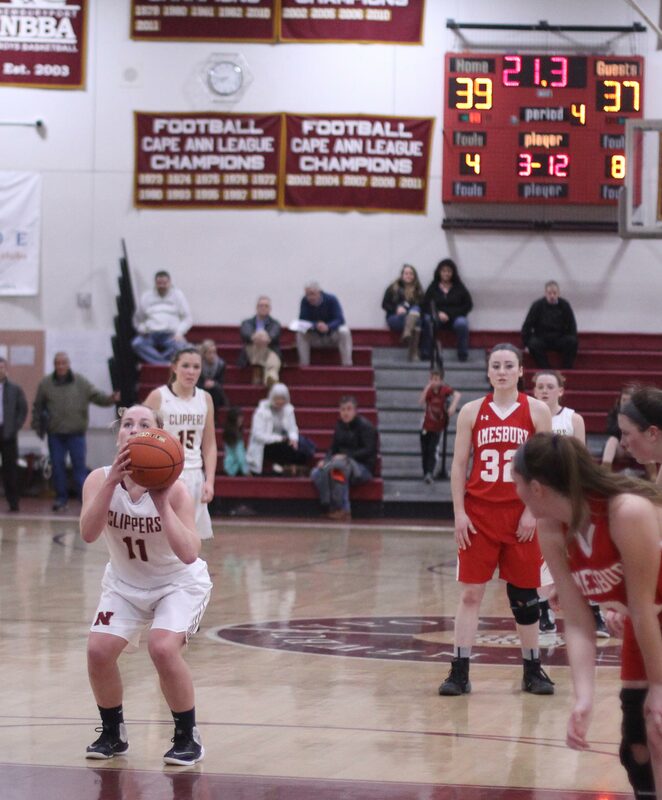 I know I’m beating this free throw thing to death but in the last 1 ½ minutes of the 2nd quarter Newburyport missed seven straight foul shots. That they only trailed by three (21-18) at the half is indicative of the type of defense they were playing. 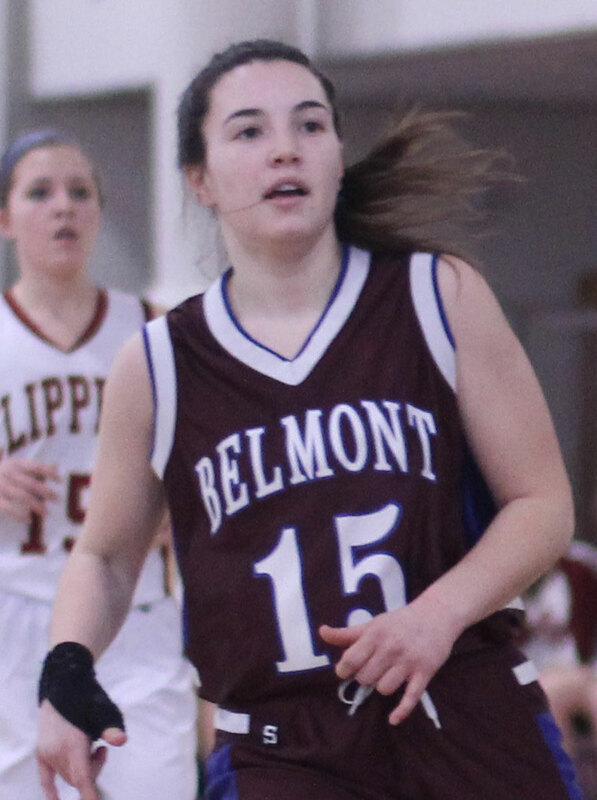 Belmont (from the Middlesex League) rode two three’s by sophomore Jenny Call to an 8-1 lead. 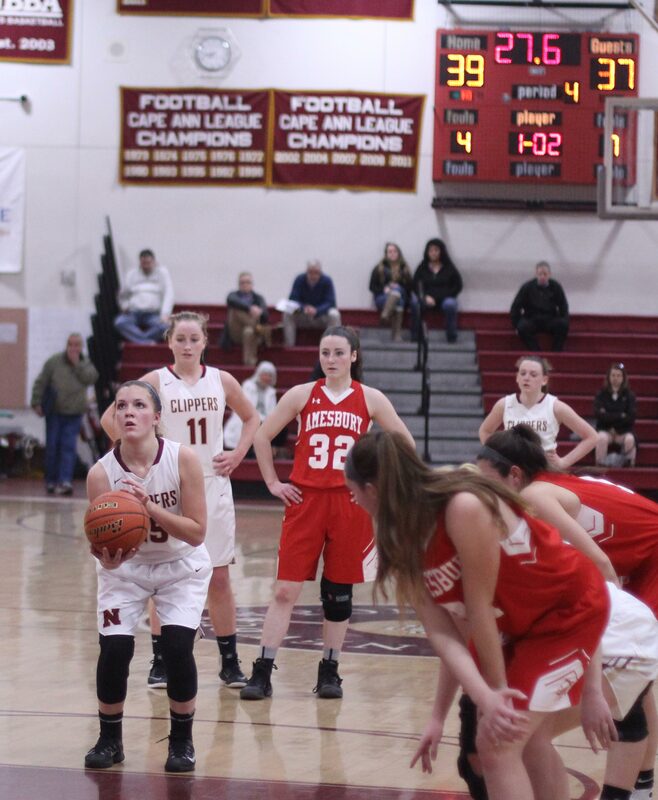 NBPT finished the quarter on a 6-1 run including a steal and layin by freshman Katie Hadden. 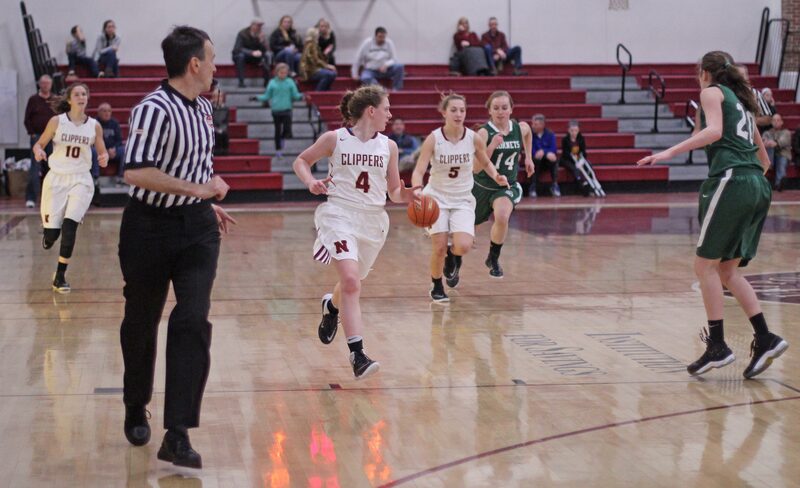 The Clippers tied the score (16-16) on a driving layup by freshman Anna Hickman (14 points) with 3 ½ to go in the second period. 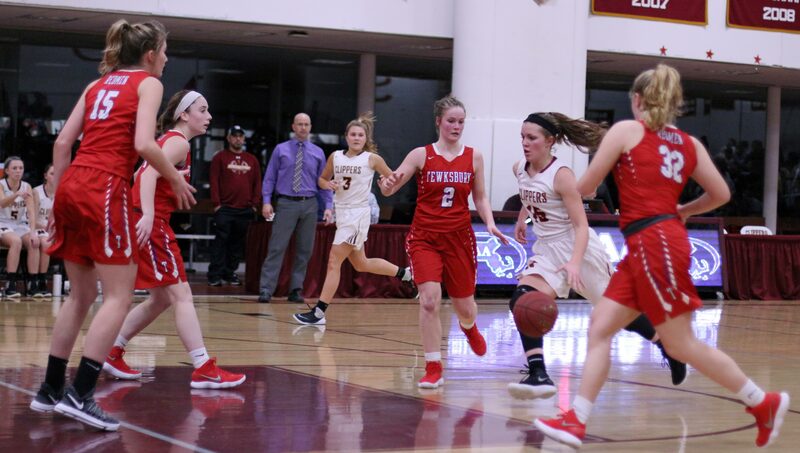 The Marauders took the lead right back and extended it to 32-23 in the third quarter with a 10-2 run. 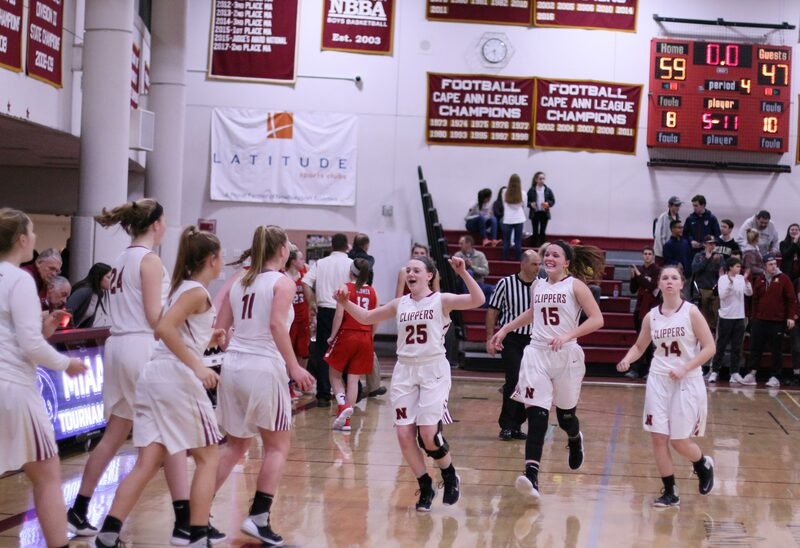 Layups by Greta Propp (10 points) and Samari Winklaar, as well as a three by Carly Christofori (9 points), keyed that surge. 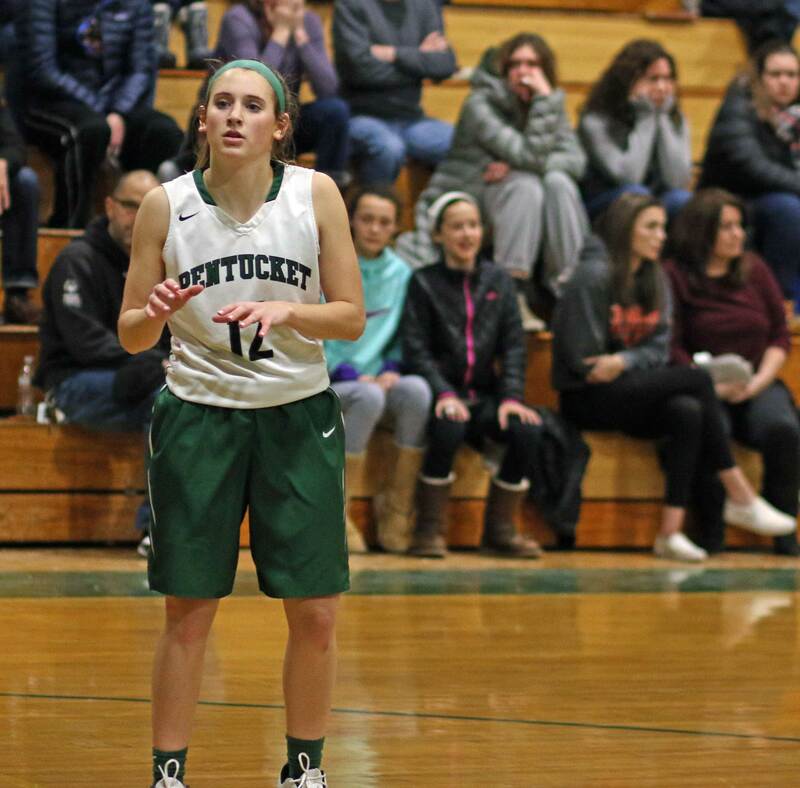 In the midst of it Emily Pettigrew took a pass in the lower key and spun left to register her 1000th point. 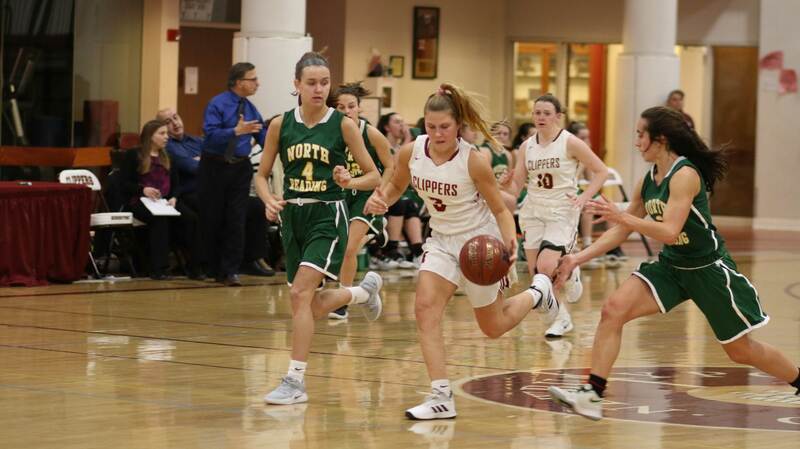 Appearing to be down and out (32-23) with 3:40 to go in the third quarter, the Clippers put twelve unanswered points together over the next six minutes of playing time to take the lead, 35-32, 2+ minutes into the final quarter. During that stretch, Belmont turned ice cold from everywhere, including the foul line, where they missed all five FT attempts. 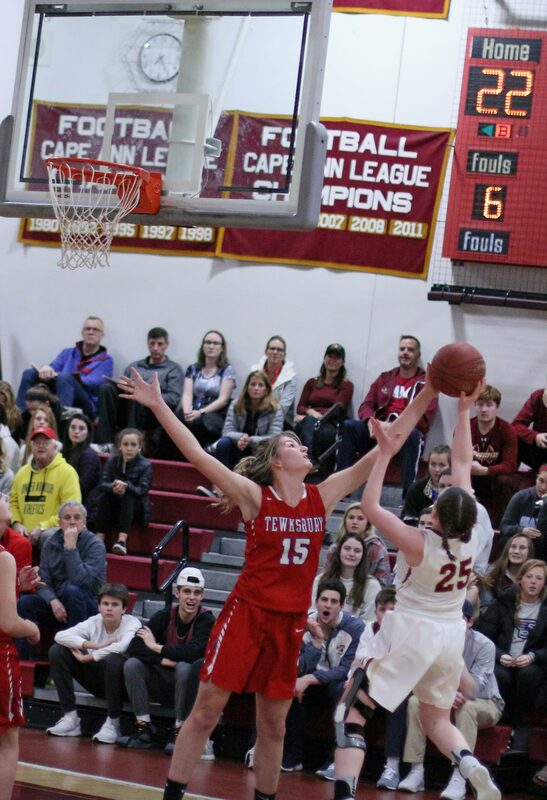 Anna Hickman had a 3-pointer and a layup, while Emily Pettigrew added two layups in the rush to the lead. In the final five minutes of this game there were four ties and five lead changes. It was clearly anyone’s game. 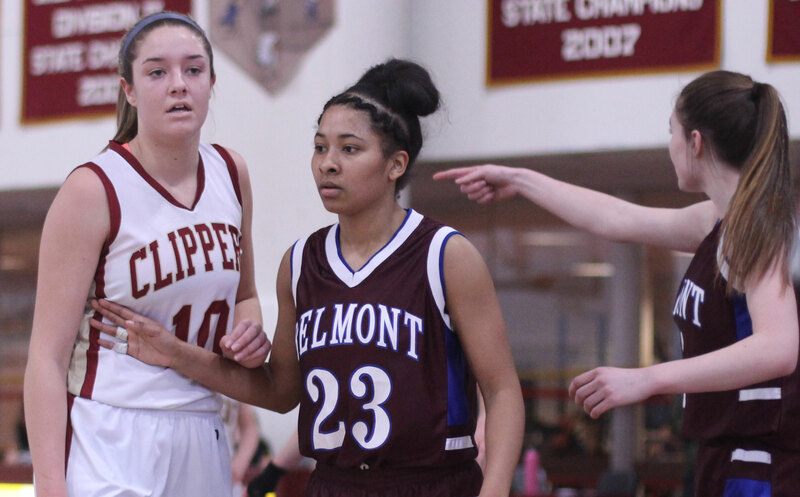 But in the final minute, Belmont made enough free throws and enough stops on defense to get the job done. Defensive hero in the last minute? Freshman Jess Giorgio. 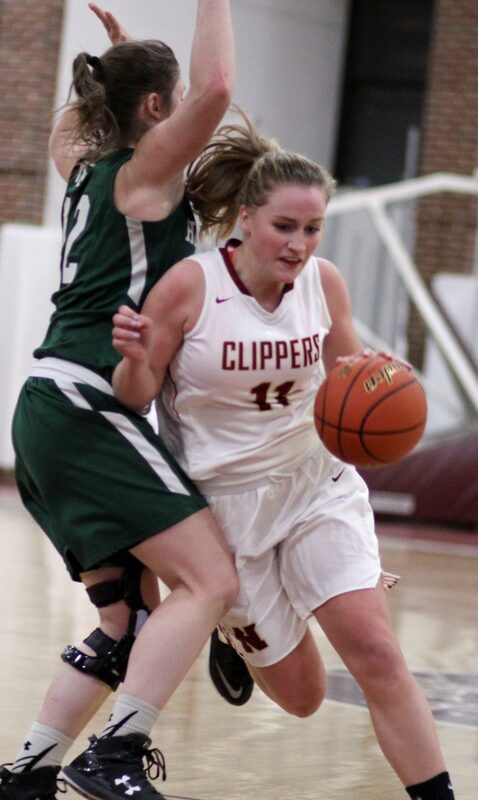 Twice the 6-1 center blocked shot attempts in close by Anna Hickman without fouling. 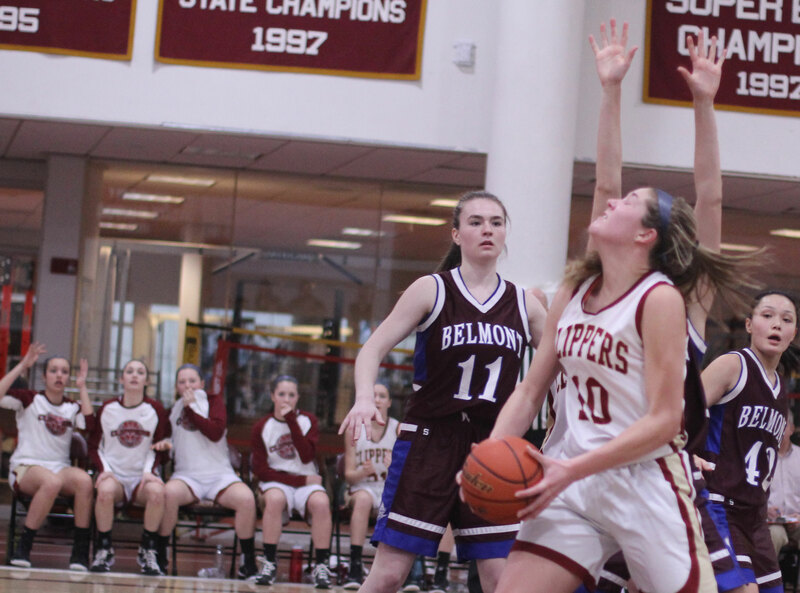 Belmont had to shoot second-half free throws in the NBPT student second end of the gymnasium. Not an easy thing to do but somehow Irini Nikolaidis managed to can four straight in the last two minutes. 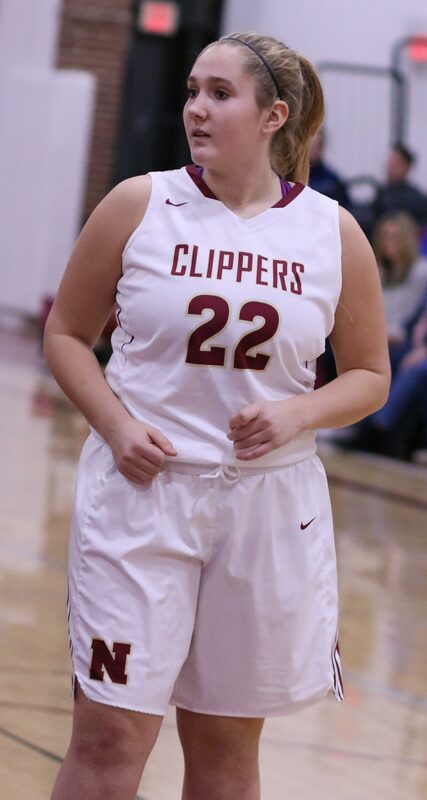 Awesome rendition of the National Anthem by the Clippers’ Paige Gouldthorpe. 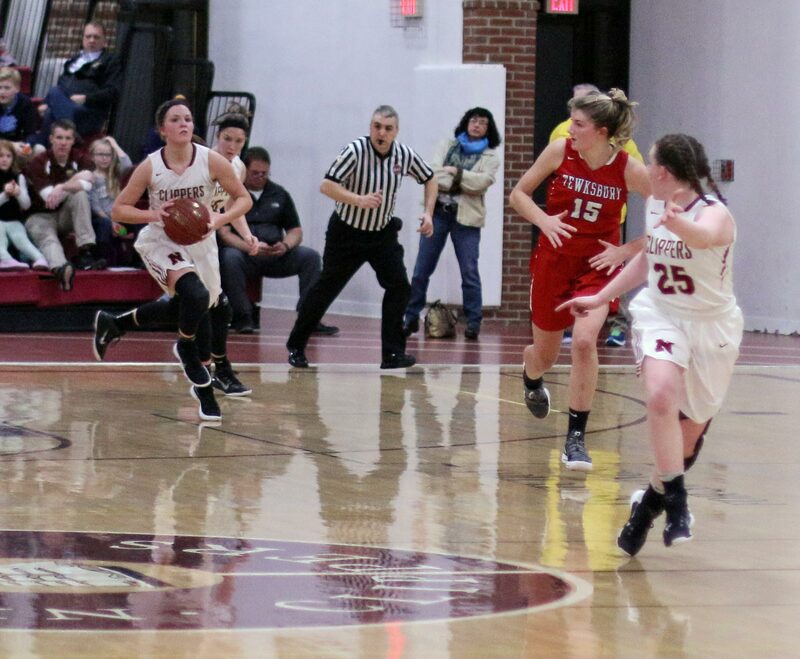 Impressed by the point-guard play of Newburyport’s Krysta Padellaro and Belmont’s Carly Christofori. 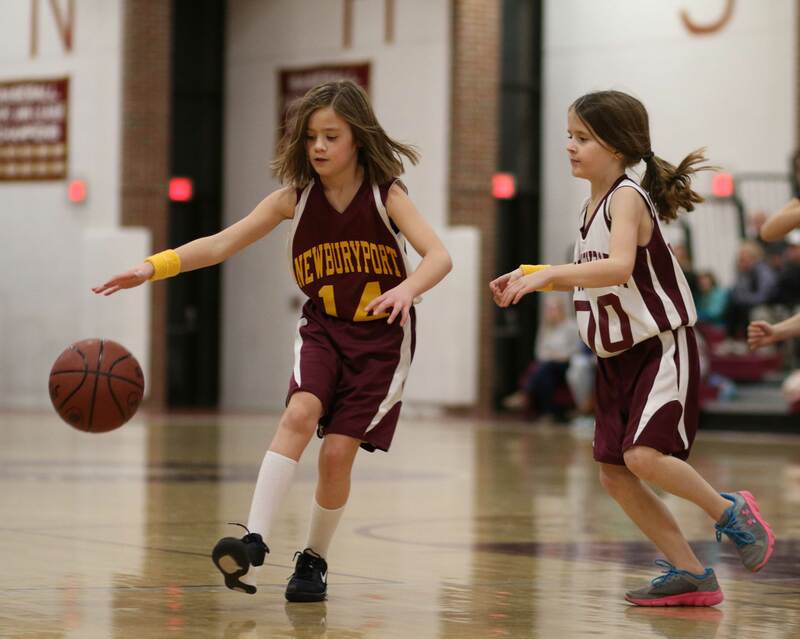 The two of them also played terrific defense. Both are only sophomores. 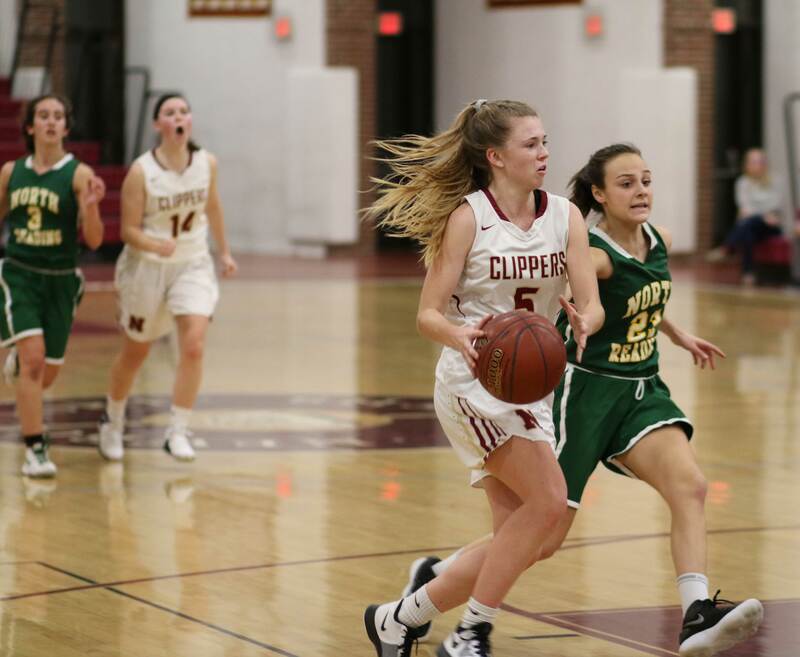 Tough 24 hours for the Newburyport basketball teams as both the boys’ and the girls’ teams were eliminated from tournament play during that time. 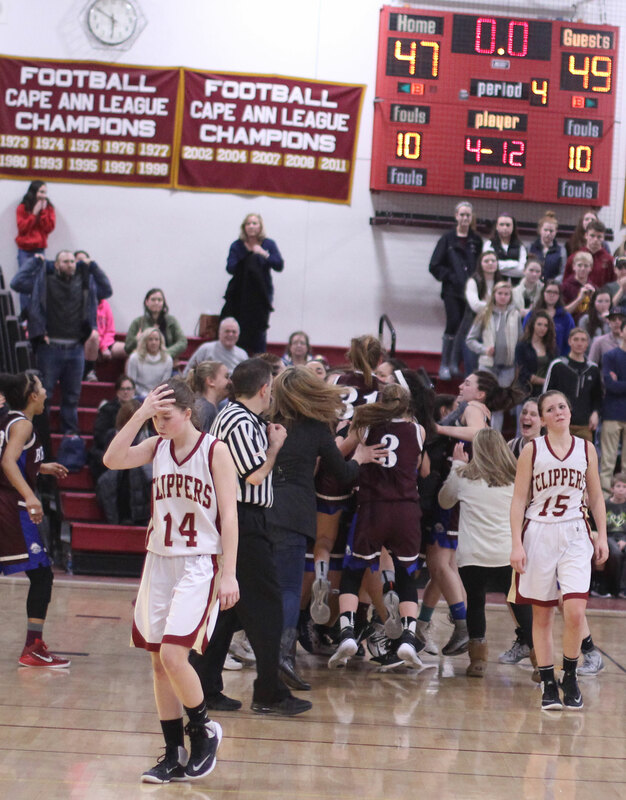 The thrill of victory and the agony of defeat.